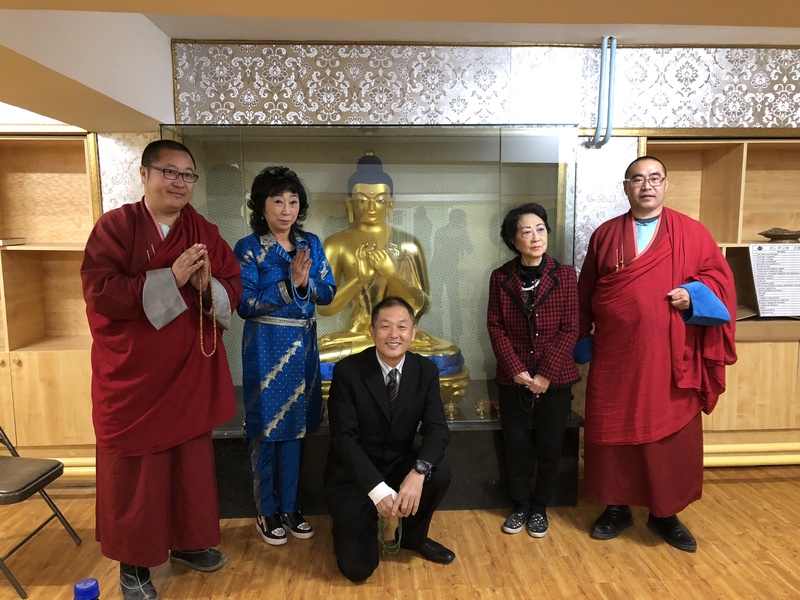 We visited The British Museum to thank them for the exhibition of Haruhiko Kaneko 's fine art work in the permanent exhibition room of the British Museum / Japan section. 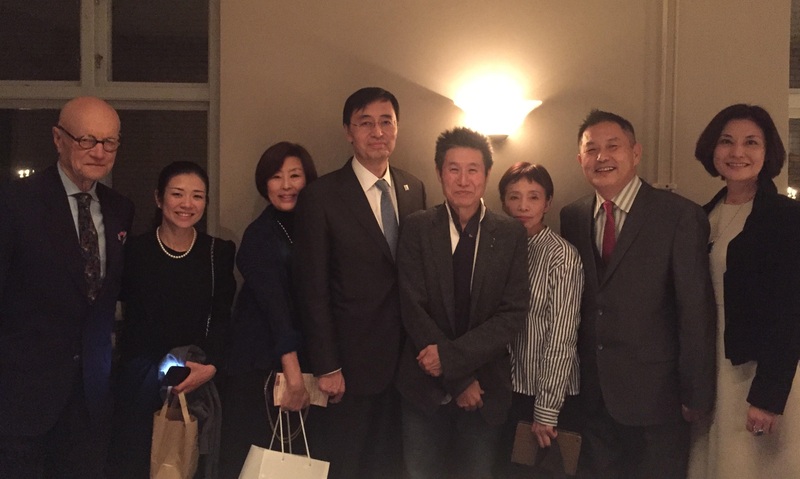 We thank Mr. Timothy Clark, head of the Japanese section and Dr. Akiko Yano for welcoming us. This is the 4th time to be participated. I am so glad I came back to France. Thank you so much for the visitors who saw my artwork “Blue wave”. My fine art has become a collection of Gimme Museum in Paris, France. I visited Director of Development Culture and Publics, Mr. Daniel Soulié and Chief Curator of Japanese Collections, Mr. Michel Maucuer. 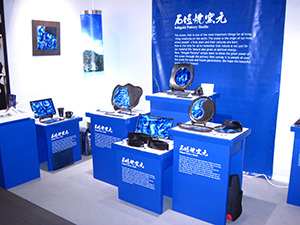 I explained creation background, production process of the works. And also attraction of Ishigaki Island, Okinawa could explain at the same time. 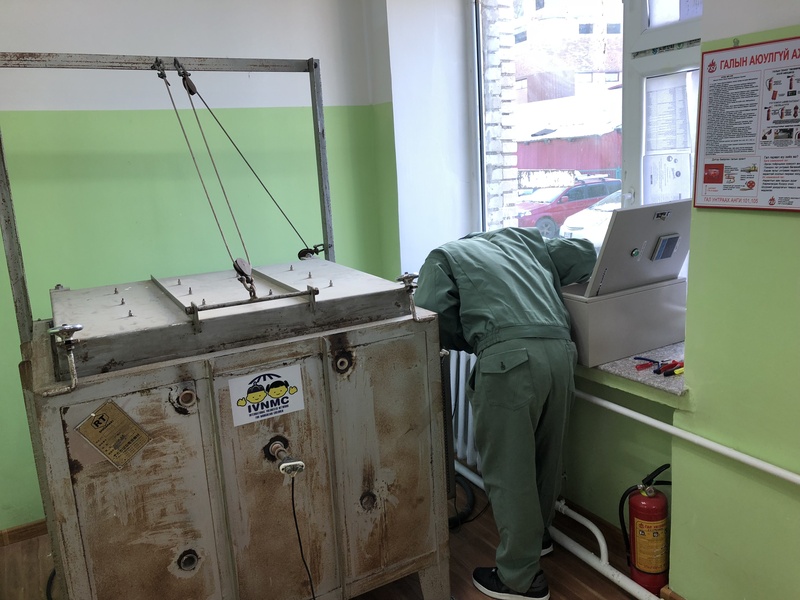 The pottery kiln computer was broken which was donated by somebody last year. It was expensive due to Made to Order. Thinking of the children, it was very frustrating and my heart hurts, I finally bought it this year and I was able to bring it to school. 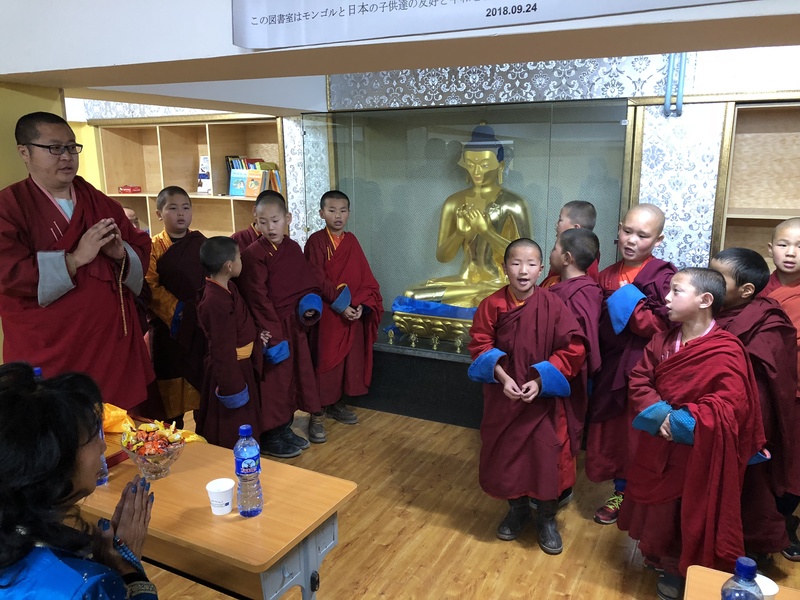 Donation of books with children library and Buddha statue with Ishigaki-yaki pottery to Gandantegchenling Monastery, and donation of books to Child care facility, Disabled child institution(29, 116school).Teaching pottery class with 29 and 116 students, Japan Center children. 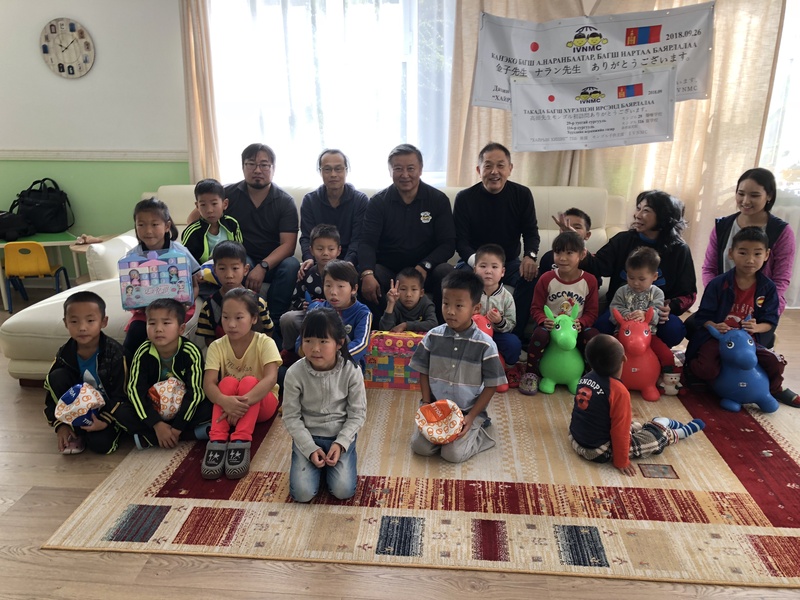 Donation was done with Ms. Eguchi Kitae and Mr. Namsrai Mongolia children support organization. 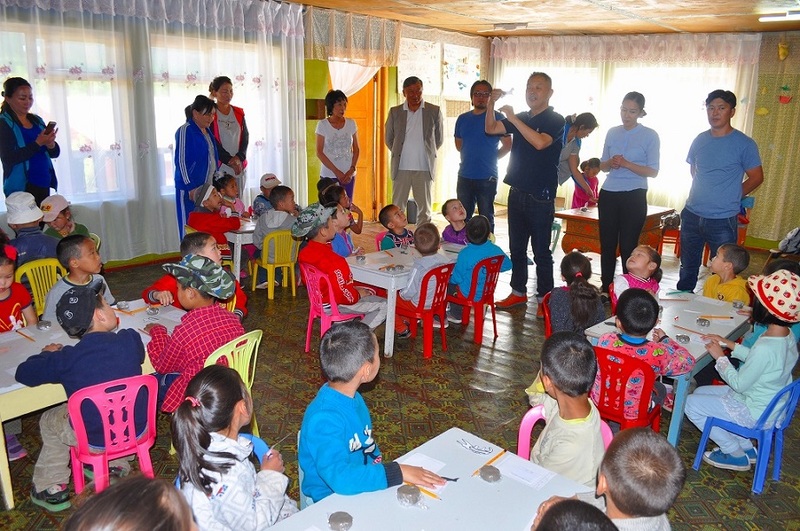 I also had a speech to Art University Children. 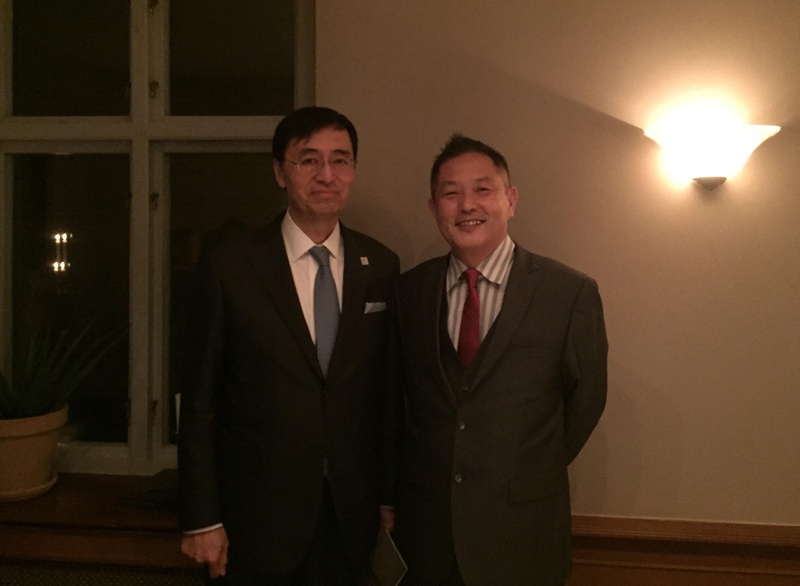 24 March 2018 "400 YEARS OF Japanese Ceramics "
Attended the opening ceremony and the gala dinner. I was extremely touched by the kindness of the organizer who came to pick me up at Copenhagen Airport all the way from Höganäs, Sweden. Höganäs is a small town with a population of just 28,000. In the 18th century, large amounts of clay was found between thin seams of coal, thus Höganäs became a pottery town. At this exhibition, there is an area dedicated to the Treasures from the 17th to 20th century. From Ko-Imari to the works of Mr. Shoji Hamada, I was amazed by the richness of the collection of the town of Höganäs. I was the only participant from Okinawa. I would feel satisfied if I could have left any footprint of Okinawa here, for our kids who might come to Höganäs after 100 years to celebrate the 250 years of diplomatic relations between Sweden and Japan. 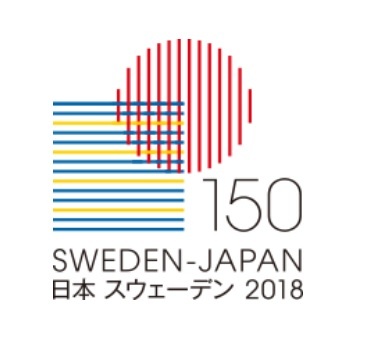 On this occasion of the 150th anniversary, I hope that many companies, museums or collectors add my pottery to their collection, and that it serves as a symbol of friendship between Sweden and Japan. And if the children from Sweden and neighbouring countries ever need a helping hand in Japan, I would be very happy to support them. I am deeply thankful for this wonderful relationship. 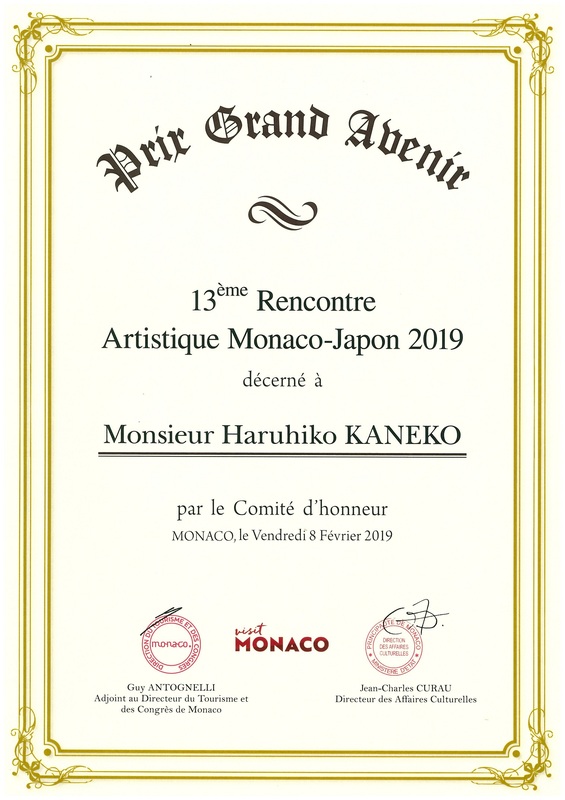 Participated in '12 ème RENCONTRE ARTISTIQUE MONACO-JAPON 2018' (MONACO-JAPAN Artistic Meeting). 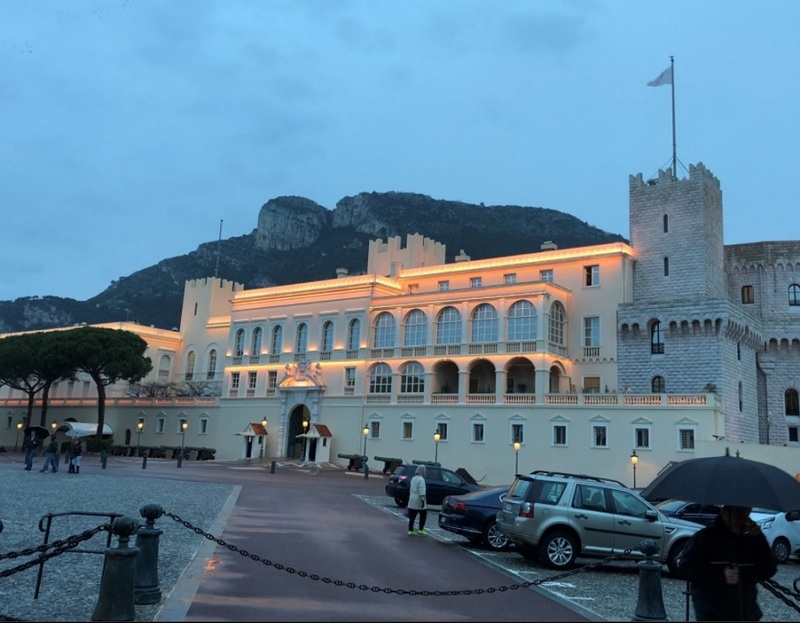 This annual event is organized by The Department of Cultural Affairs of Monaco and Monaco Government Tourist and Convention Bureau. This year, a part of the exhibit fee was donated to Amitié Sans Frontières Internationale (ASFI), which was one of the reasons I participated. The renowned painter Mr. Alain Bazard, who represents the painting department of 'Le Salon" (the Association of French Painters and Sculptors), was the general supervisor of this event. My artwork was displayed among the works of the artists from Le Salon. I was pleased to receive compliments and honored to be awarded an 'Arts and Culture Award' by The Department of Cultural Affairs of Monaco. 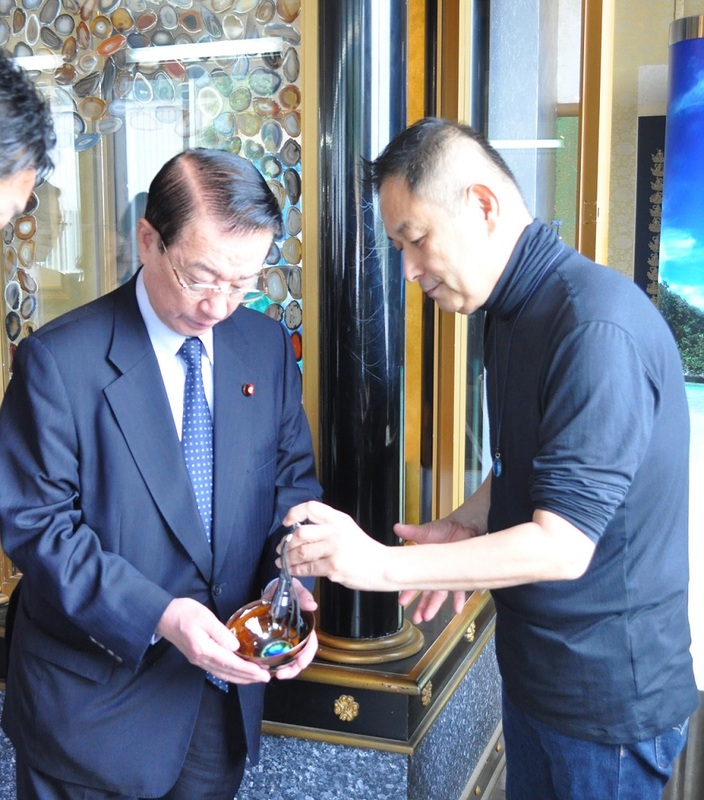 18th January 2018 Mr. Tetsuma Esaki, the Minister of State for Okinawa and Northern Territories Affairs, visited Ishigaki-yaki Pottery. I was pleased by Mr Tetsuma Esaki's visit to our Ishigaki-yaki Pottery today. A delightful person, Mr. Esaki purchased some of our products. I wish him good health and look forward to seeing him again. 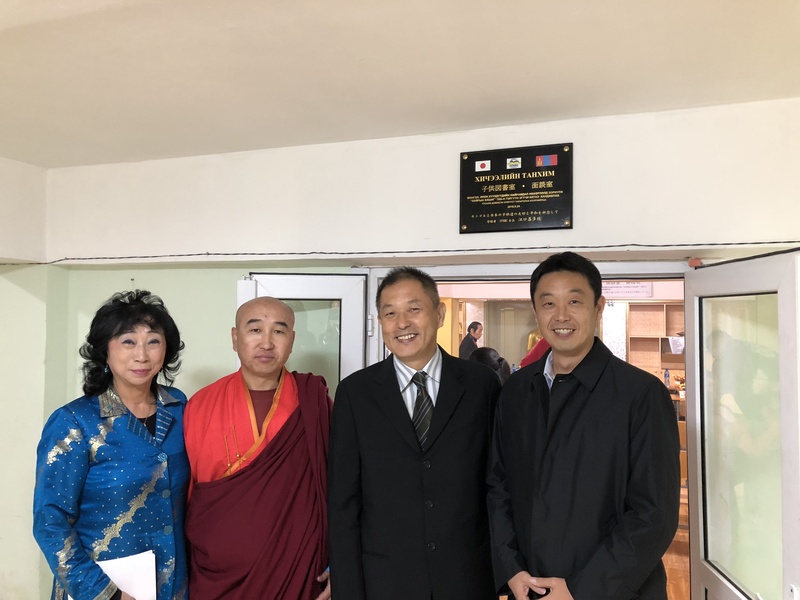 I am grateful for the appreciation I received for my artwork displayed at the Ministry of Foreign Affaires of Mongolia. 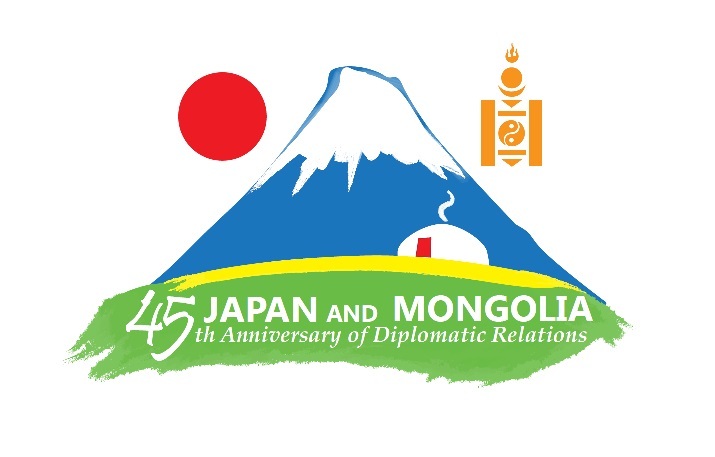 I created a hundred original Mongolian shot-glasses especially for the Ministry to celebrate the 45th anniversary of diplomatic relations between Mongolia and Japan. Dozens of these glasses were used as a special prize, awarded for academic achievement. I hope this will further the bond between our two nations. 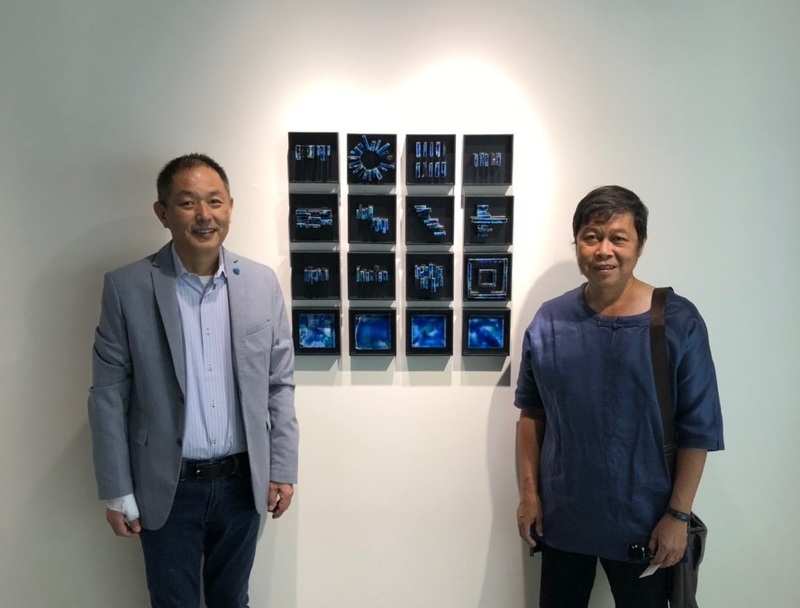 In order to report that the two artworks were installed at the British Museum last September, I made a courtesy call on the mayor of Ishigaki. 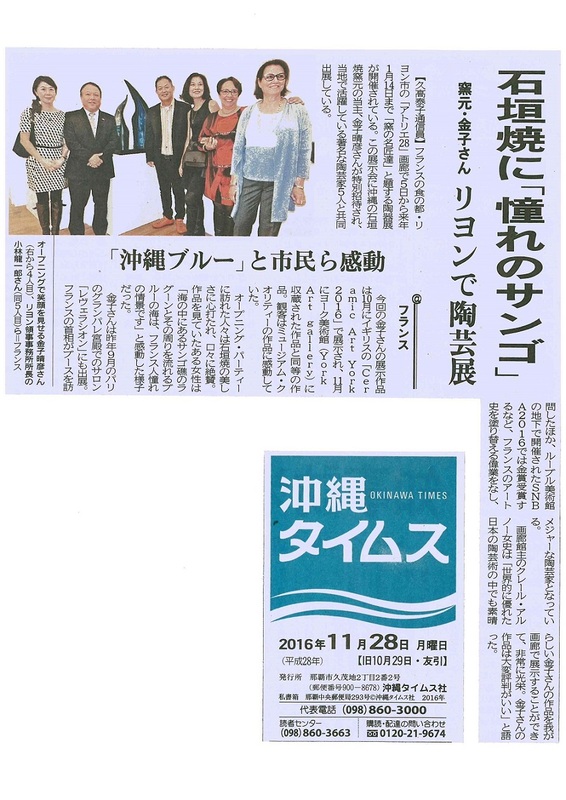 I am pleased to contribute to the development of the culture of Okinawa. 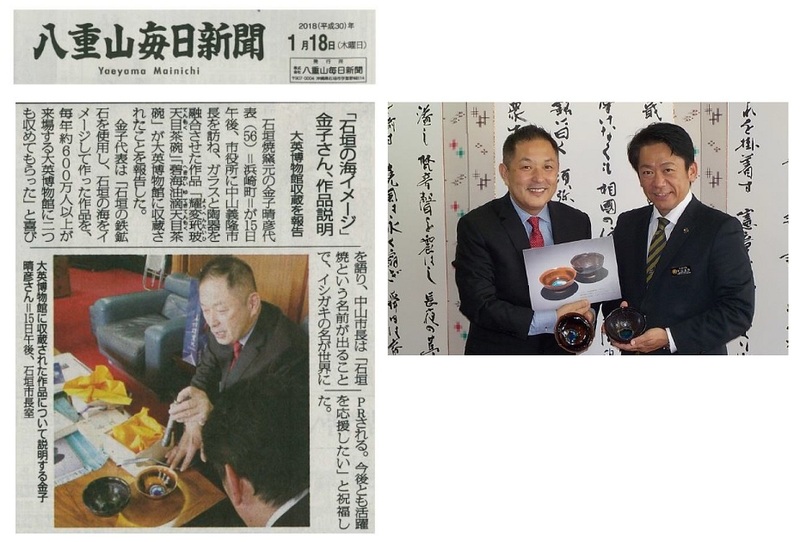 The mayor much appreciated that the bowls from Okinawa are now in the British Museum. 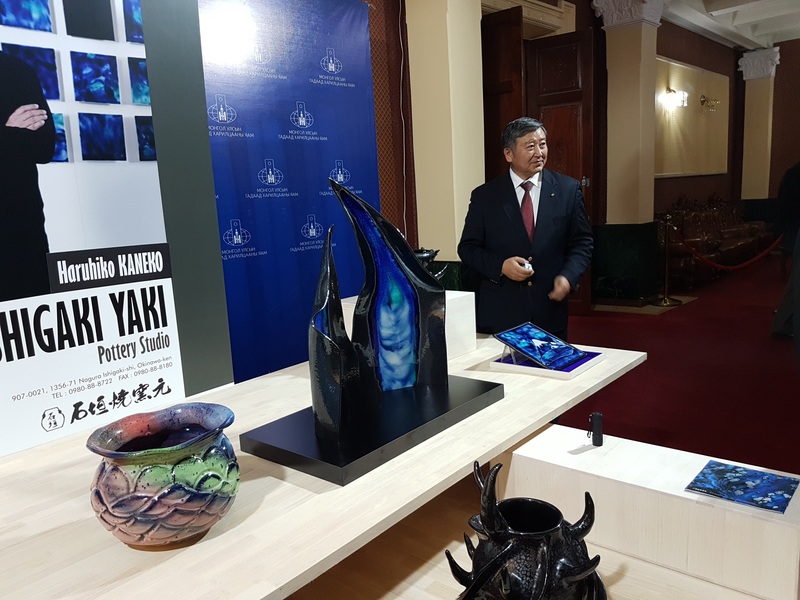 December 2017 THE HARUHIKO KANEKO ART EXHIBITION, organized by Ministry of Foreign Affaires of Mongolia, was held to mark the establishment of diplomatic relations between Mongolia and Japan. 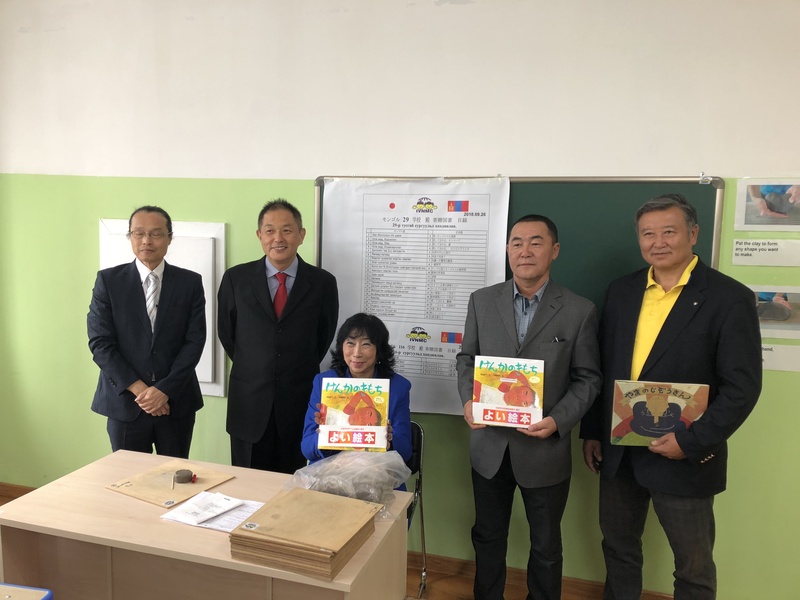 As a part of the memorial project to celebrate the 45th anniversary of diplomatic relations between Mongolia and Japan, THE HARUHIKO KANEKO ART EXHIBITION was held at the Ministry of Foreign Affaires of Mongolia. This event was much appreciated by the staff of the Ministry, as well as VIPs and diplomats from other countries. The 'HEKIKAI' yuteki tenmoku tea bowl and the 'YOHEN' taihi tenmoku tea bowl have now been added to the public collection of the British Museum. “'HEKIKAI' is the yuteki tenmoku tea bowl” created by reproducing a glaze from the Southern Song period (12-13th century). It represents the authentic character of an iron glaze, shining silver under the light but changing to brown, red-brown or red-purple when the light is off. 'YOHEN' refers to that which shines with a rainbow-colour, however, this 'YOHEN' taihi tenmoku has a particular jewel-like sparkle, never seen before and thus widely reported in newspapers, tv programs and magazines in Japan. 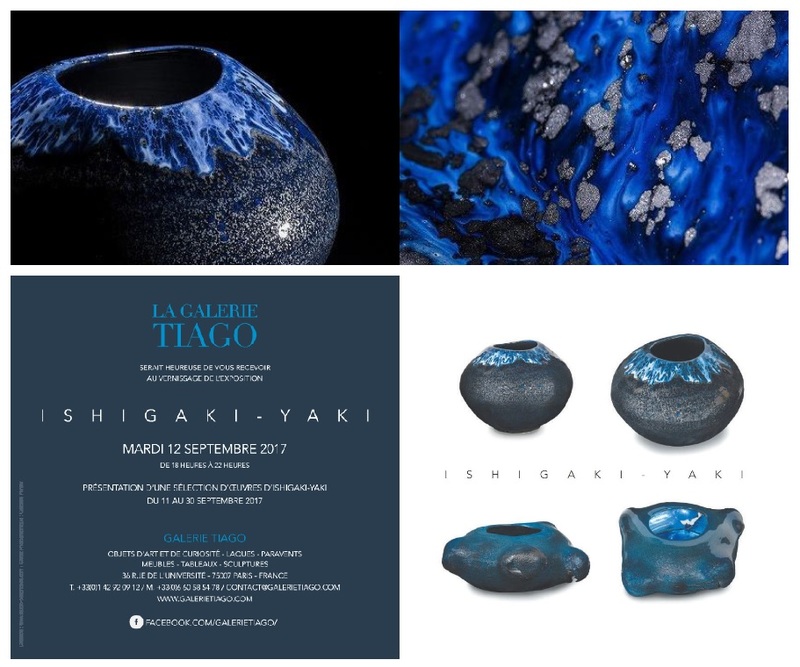 I would like to announce for the exhibition of the Ishigaki-yaki Pottery Studio at the Gallery TIAGO in Paris, France. 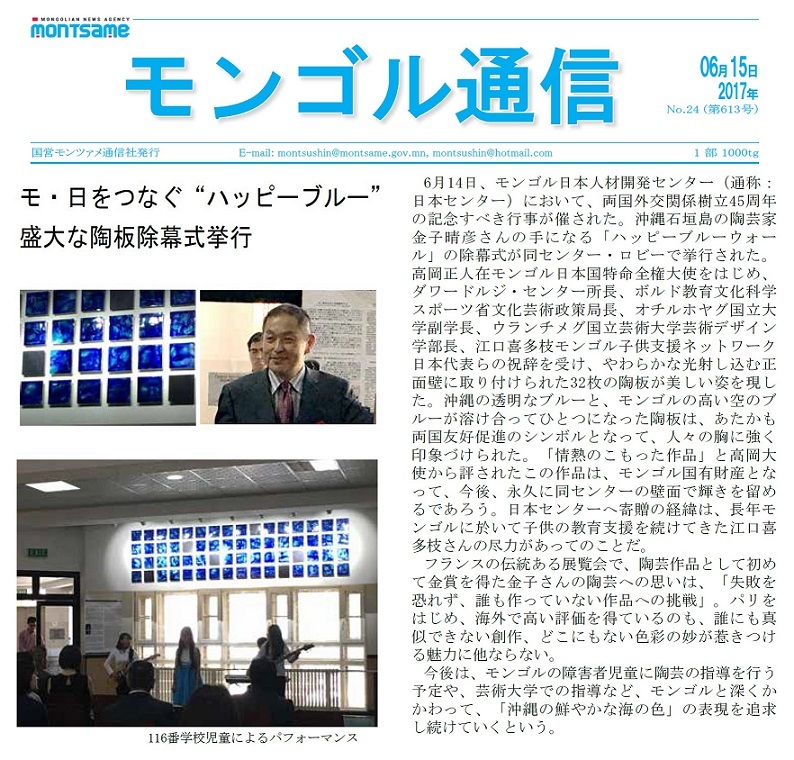 5 September 2017 Donated ≪ Silent Blue Wall (128 works) ≫ made with Mongolian and Japanese clay at the ".Mongolian State University of Arts and Culture". 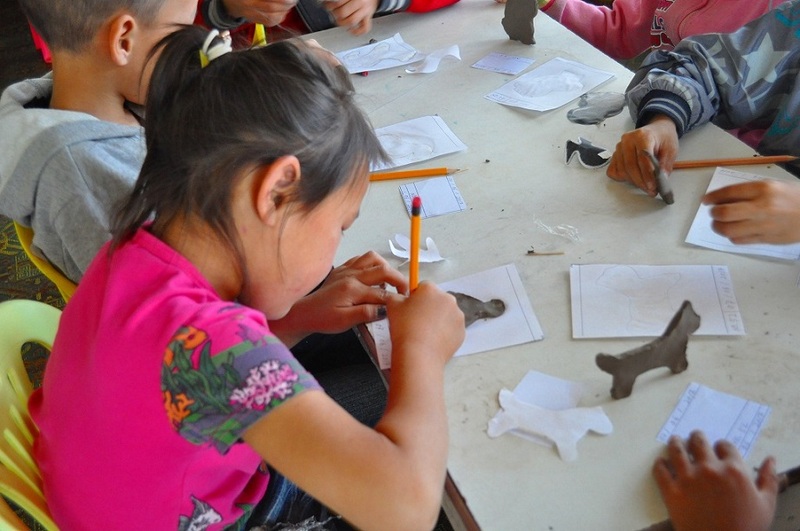 We had a request from University to　create ≪ blue wall ≫in Mongolian and Japanese clay. 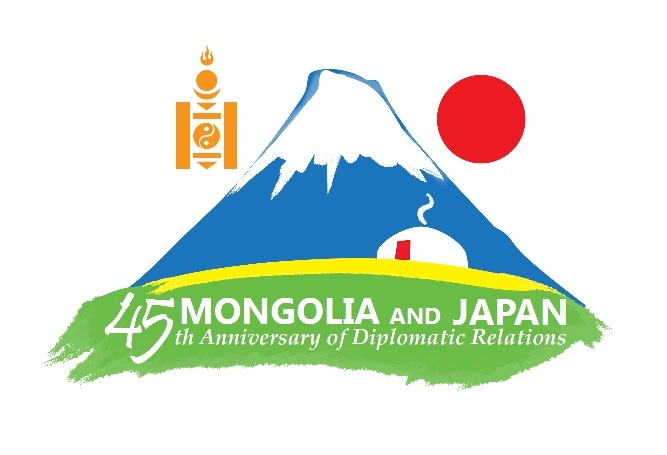 we spent about a year to work on this memorial project to mark the 45th anniversary of Japan-Mongolia diplomatic relations. 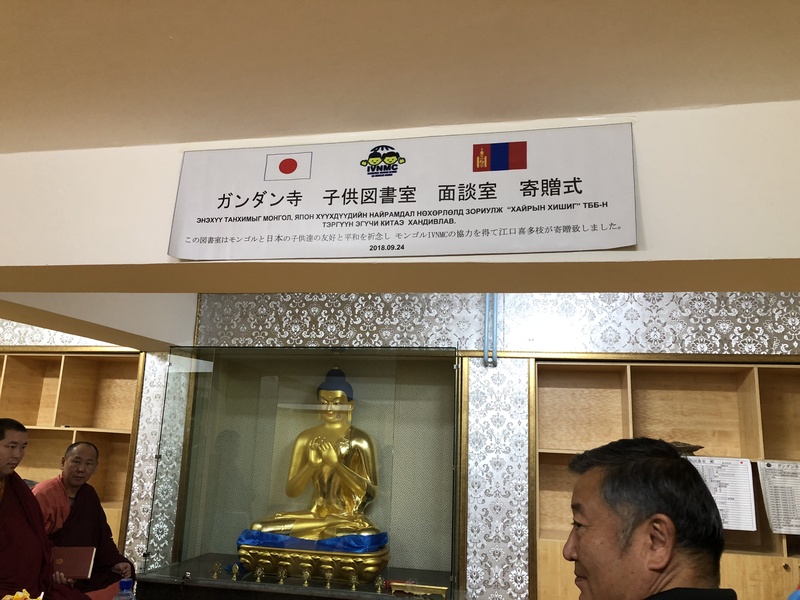 (Certified project of Mongolian embassy in Japan), We donated 128 of the 136 most beautiful works to the "blue walls". 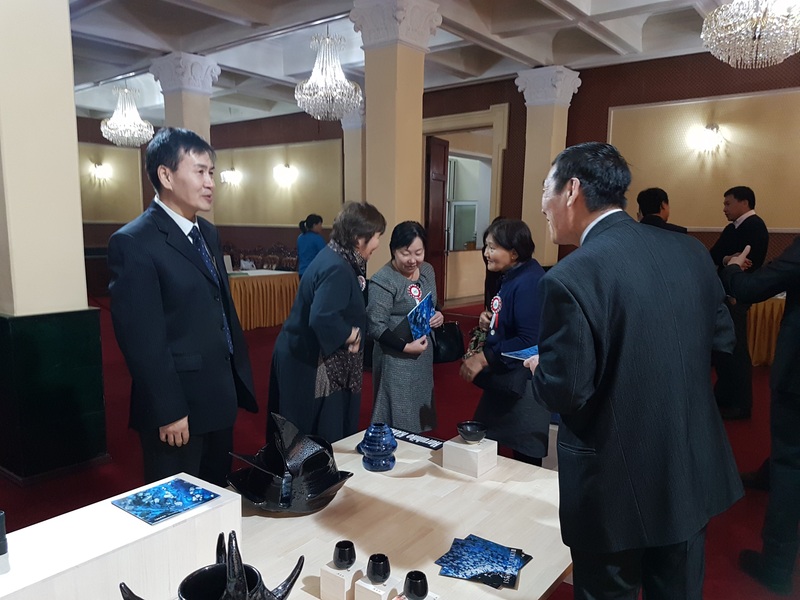 It become a permanent exhibition at Mongolian State University of the Arts and Culture. Blue is considered to be the color of ≪ hope ≫. 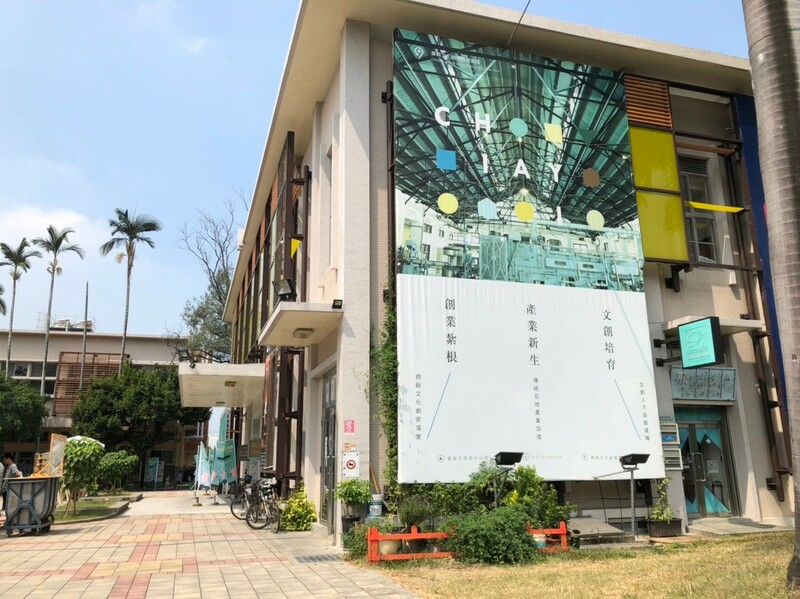 This silent Blue Wall's work became a symbol of hope for the students of the University, it is encouraging the students never give up and always have an unshakable spirit. 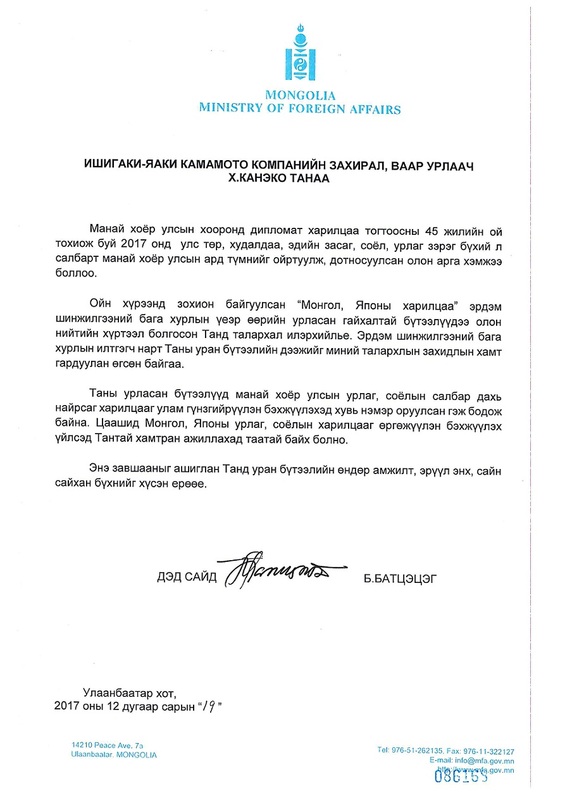 During the donation ceremony, there was a　surprise from President Sonintogas. 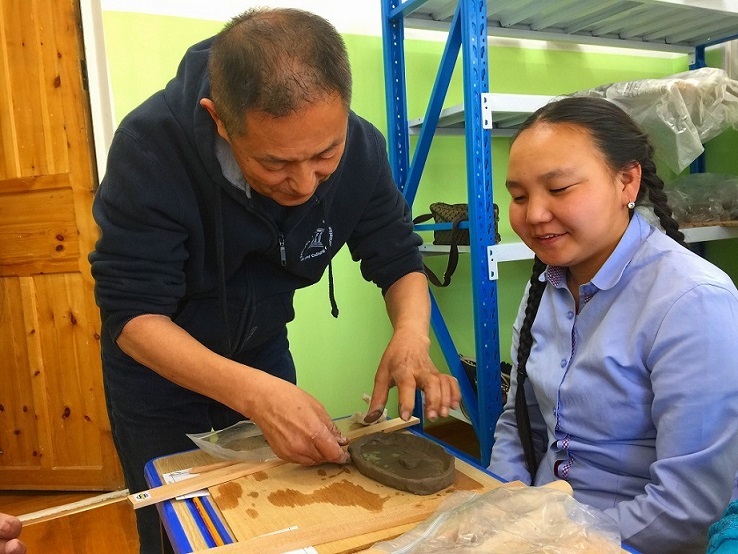 As a leader in the "fusion of glass and pottery" and leading a new trend of pottery in Mongolia, I was awarded the title of honorary professor. 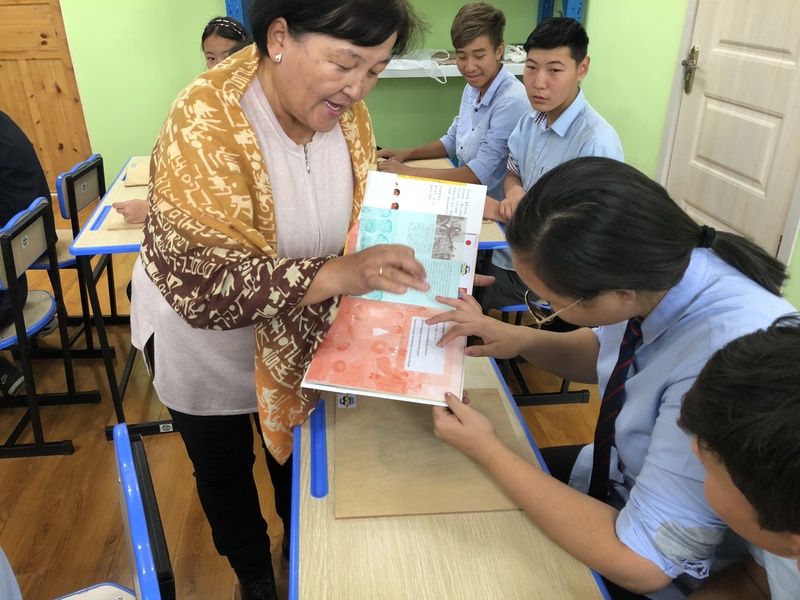 Mongolian State University of Art and Culture is Mongolia's first national university for arts. It produced a number of leading musicians, dancers,and other artists. 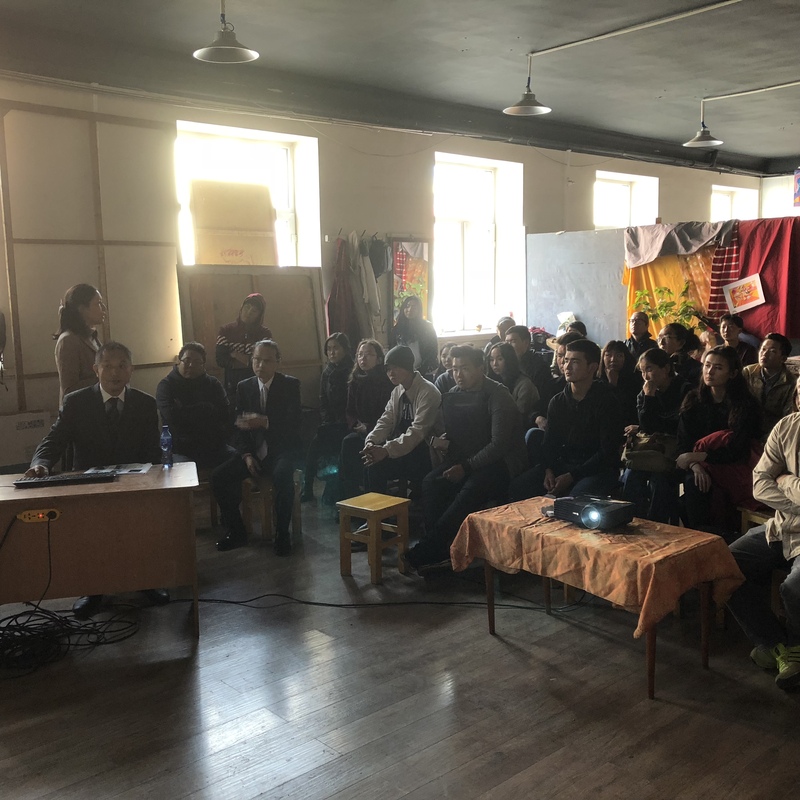 Since last year ISHIGAKI YAKI has been thinking what we can do for donation of the ceramics classroom to 29 Mongolian school and we were visit in Ulaanbaatar, Mongoli In july and the end of August Since the voltage of the kiln brought by IVNMC from Japan in may is different from Mongolia. 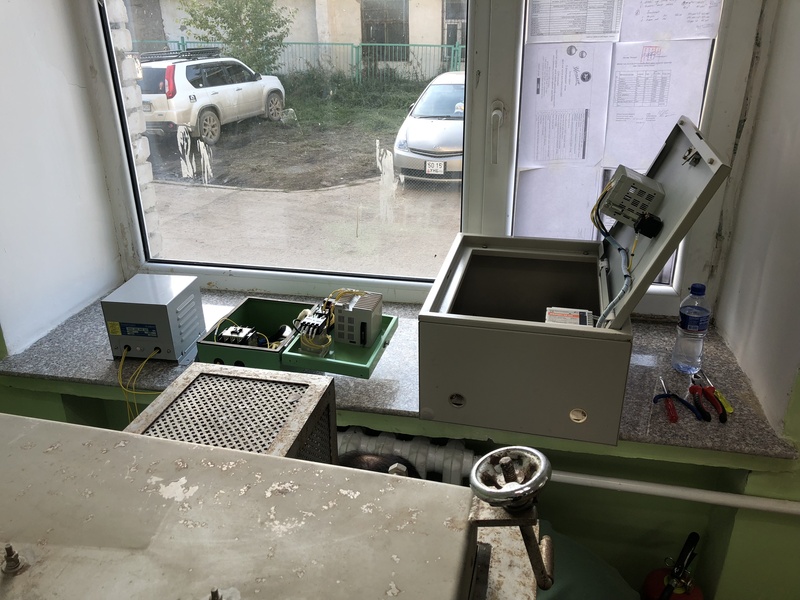 This time, with a new transformer from Japan we managed to go through the trial operation and made it in time for ceremony. 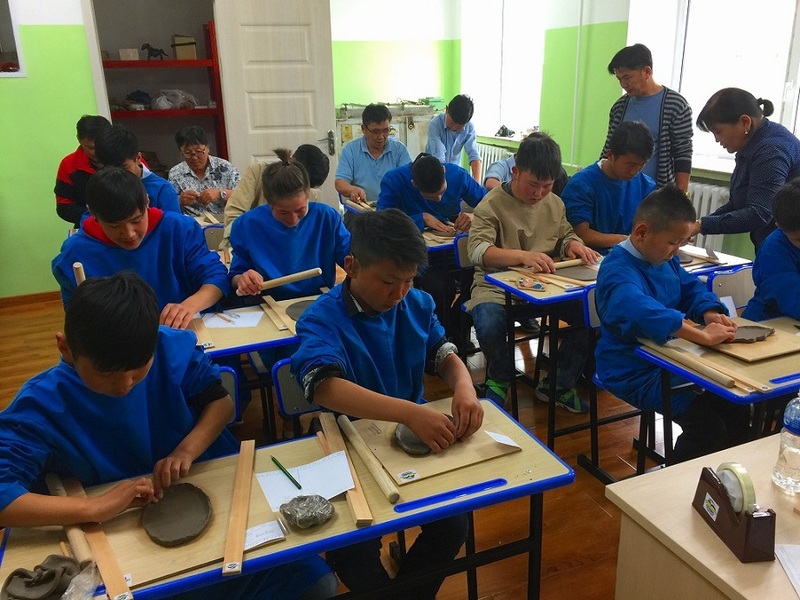 We donated ceramic pottery class with child support IVNMC so that 29 schools (hearing impaired) and 116 schools (visually impaired) can learn ceramics. 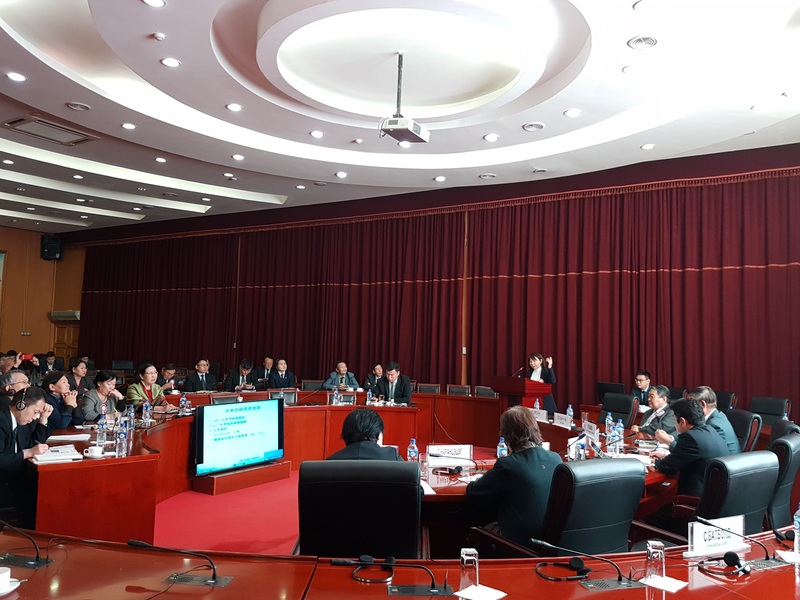 We appreciate IVNMC Mongolia’s cooperation. 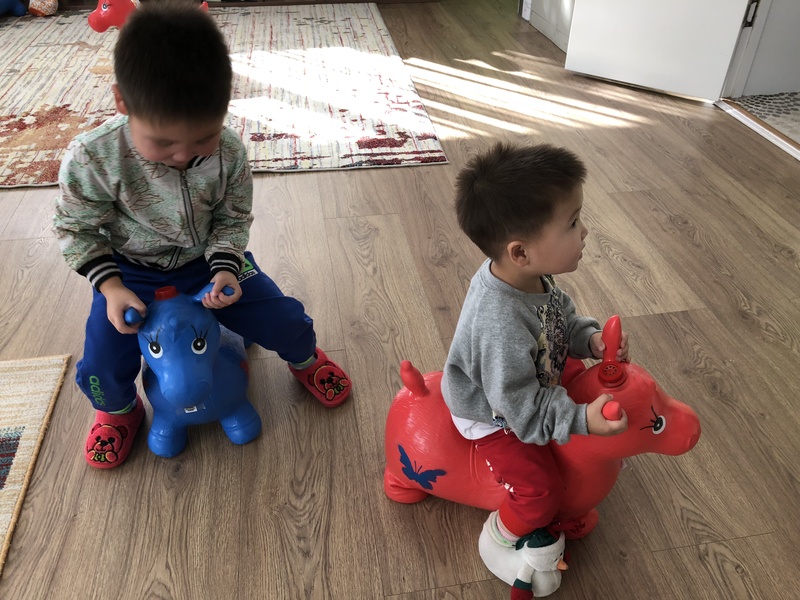 This center will be the gate way when Mongolian people to Japan Hope Children are always curious, do not give up, embrace ambition, we would like to have you go over to Japan. Also, blue is said to be the color of hope. I hope that Blue wall, along with the Japan center, will symbolize the hope of the future children. And I wish Happy Blue wall will continue to illuminate the light of hope no matter what time will came as a proof of Mongolian and Japan’s eternal friendship. 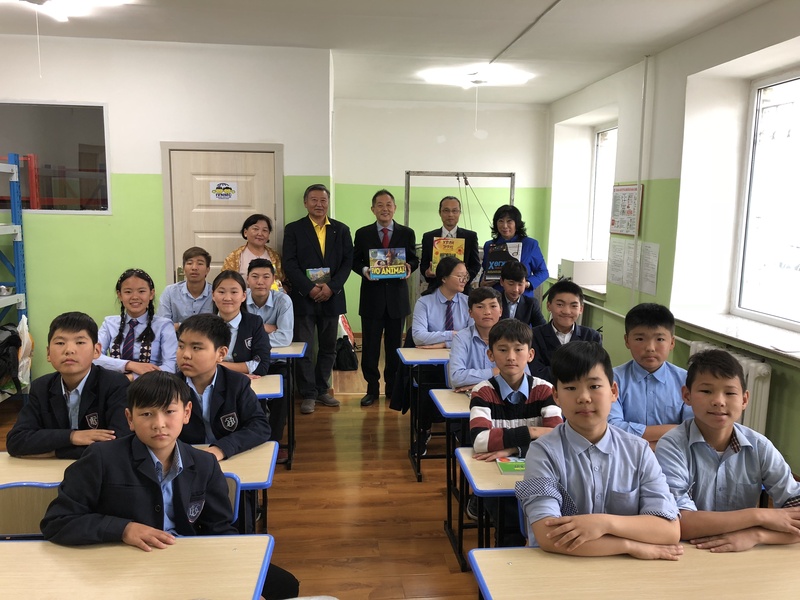 Last August, I accompanied Mongolian Children’s support (IVNMC ) Mr. Eguchi Children’s Association and members with a summer camp of a child care facility and carried out a “blue sky origami classroom”and handed out sweets to children. What I can do for pottery promises to have fun in ceramics and thingking to visit. 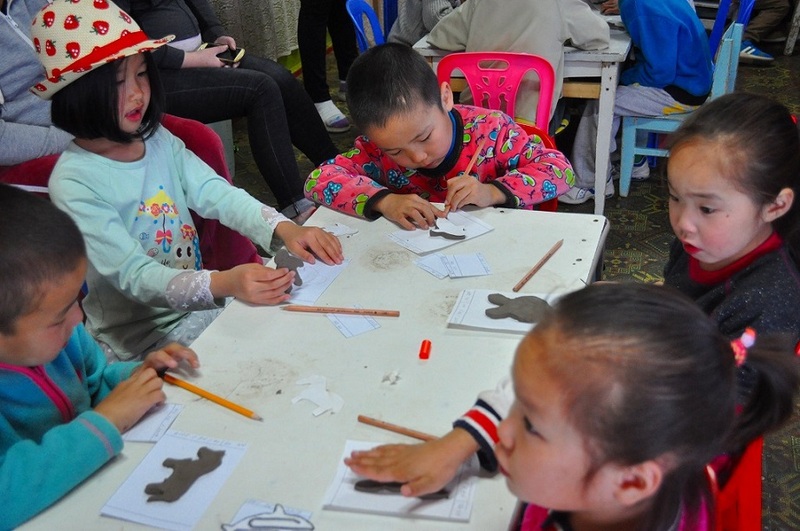 June this year, children in government orphanage enjouyed ceramics. 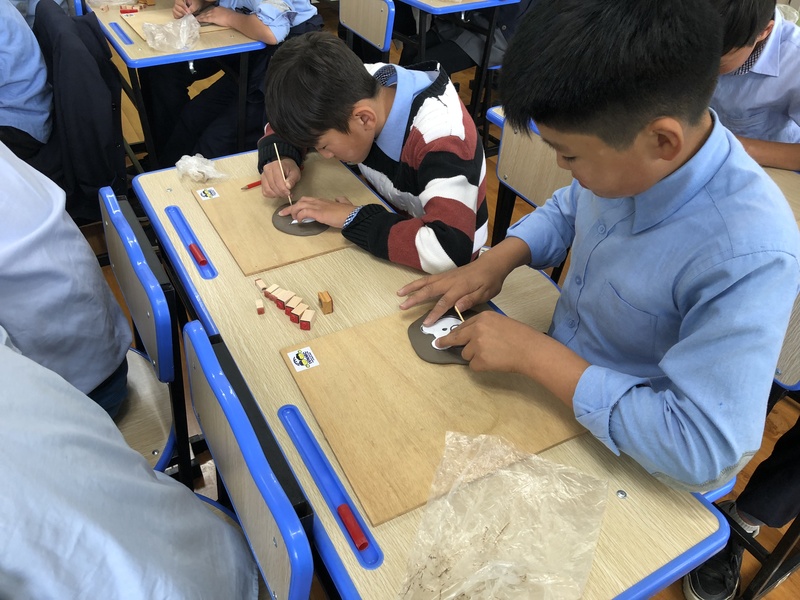 We also experienced ceramics at 29 schools for hearing impaired children and 116 schools for visually impaired children. 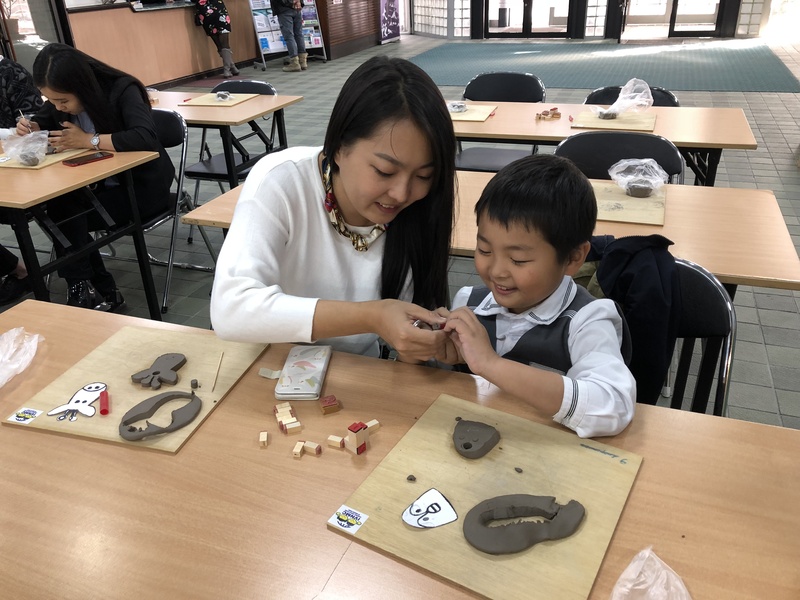 As for a support for independence, listening to the story that we would like to offer crafting ceramics to children with no access to pottery, Thingking that we can cooperate somewhere as Ishiyaki Yaki pottery. 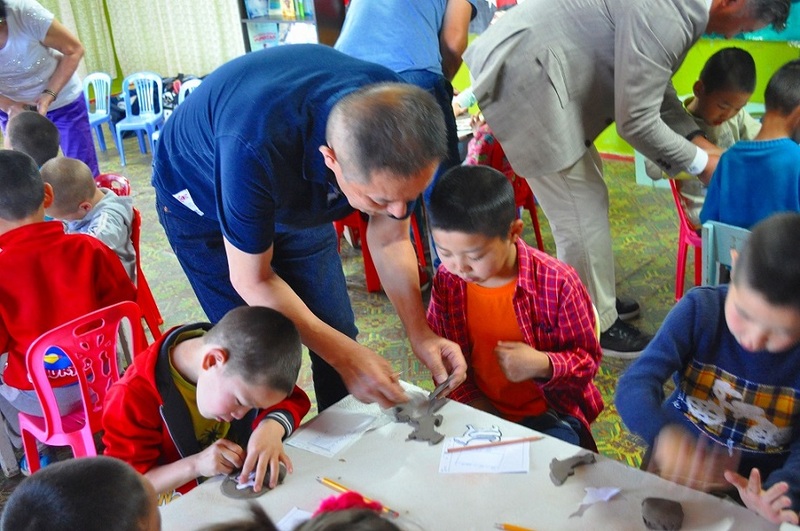 30 pottery utensils, glazes(11kinds) clay 1,6 tons, other necessary items were provided free of charge. In the experience ceramics class,we held expriences for free this time for participants to enjoy without burden. 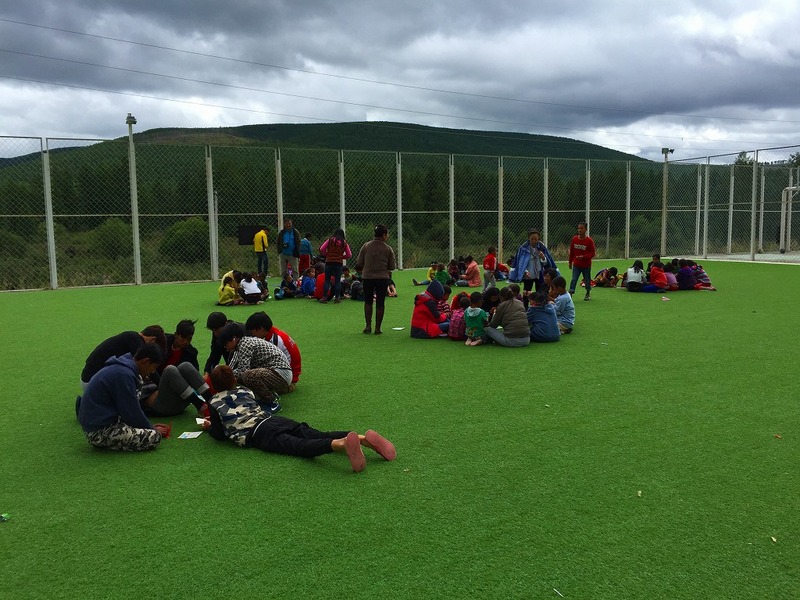 Eventually I was able to experience the 129 children who exceeded my expectations significantly.Initally. Children who were expressionless atarded to perrery and turned into a smile while we saw it, I was glad that their smile was unbearable. Visually impaired.children touched horse object and oil droplet tea bowl. Some of the children were interested in the slick feel of the glaze when they touched the hourse. 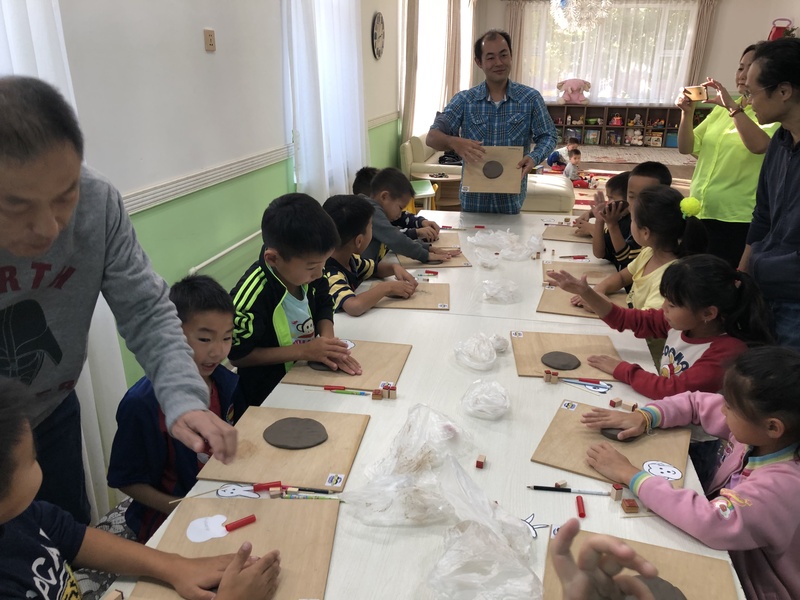 Also, I was surprised honestly when I was told from a child who touched Tenmye tea bowl “what a beautiful design it is” I hope to go to see these children again next year. 29 May 2017 This article appeared in Ryukyu shimpo. Salon Revelation was held once every two years at Grand plais in Paris, France. This year is the third time and despite the French presidential election, it was estimated that 45,000 of visitors came to this event. The surprising visit of Prince Guillaume, Hereditary Grand Duke of Luxembourg and Princess Stephanie, Hereditary Grand Duchess of Luxembourg also brought this venue to the peak. This year the country of honor is the Republic of Chile. Chilean minister of Culture, Ernesto Ottone Ramirez themed this event as a peek of Chilean culture and economic. The reception was held at Latin American Guest House, and the event organizers rolled out the red carpet for the guests. It was a very pleasant experience for me to walk on the red carpet for the first time. As for this work ≪ curiosity ≪ this theme, peeping through the sideway of this work, you could see the sea world of Okinawa. There were many cheers from the visitors. I was also able to advertise the Okinawa to the world. Introduced O+ Connecting Okinawa held on 29th April O+ connecting okinawa is an event organized by high school student entrepreneurs, planned and prepared. 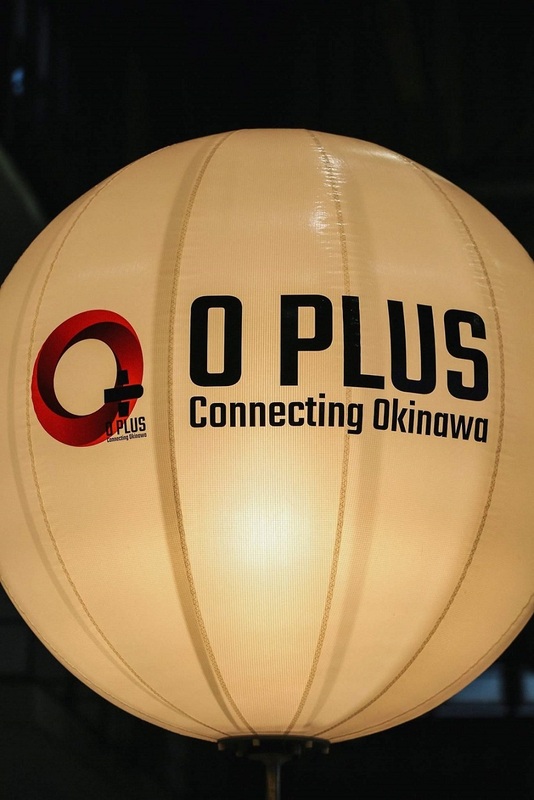 This expressing orginal ideas invitation- based trip event made by People who are active in Okinawa prefecture or out of the prefecture, or overseas. I am happy to announce that I have been selected to participate in the Salon Revelations 2017, scheduled to be held from 3 May to 8 May 2017 at the Grand Palais, Paris, France. This is my third times in a row to exhibit some of my artworks in this prestigous art fair. I am already excited to enjoy the beautiful season in May in Paris. Whoever has plan to visit Paris during this period are very welcome to the Salon Revelations 2017 at the Grand Palais! 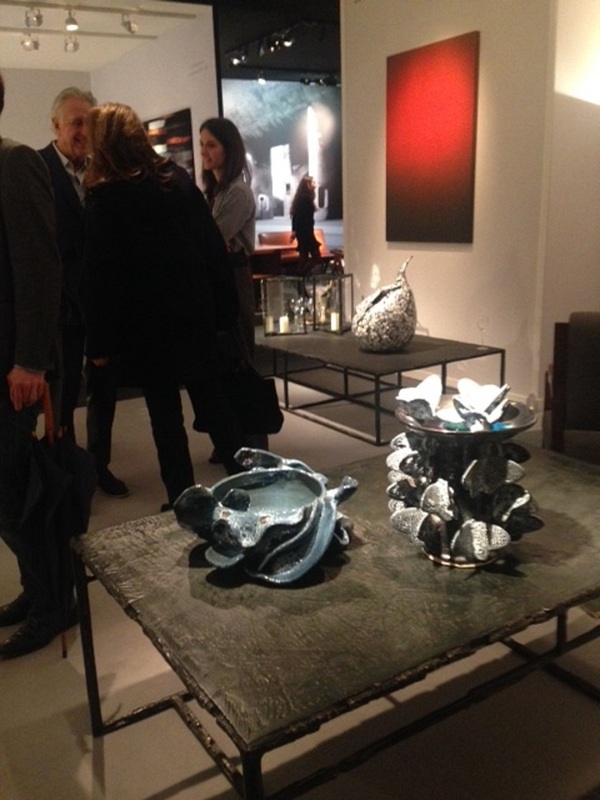 Collect is an unrivalled opportunity to see and buy contemporary museum-quality ceramics, etc. from established and emerging artists and makers represented by the world's finest galleries .in the inspiring environment of the Saatchi Gallery visitors can indulge both their passion for collecting and their interest in design and interiors. This is the artwork I exhibited in Salon des Beaux Arts 2016, one of the most prestigious exhibition in which I was awarded two golden medals last year. This artwork has more than 170 cm in height. As you may be aware, large pieces are very rare in pottery. Not only is the successful firing of a large piece challenging, but also the fusion of pottery and glass ? the most important feature of Ishigaki-yaki Pottery that we excel - adds more challenge to overcome, because pottery and glass have different shrinkage ratios. It took more than a year to finish the piece. Blue and light have long been considered to represent hope in Japan and Europe since the ancient times. This artwork represents the ray of mercy that encompasses all beings with unwavering hope. 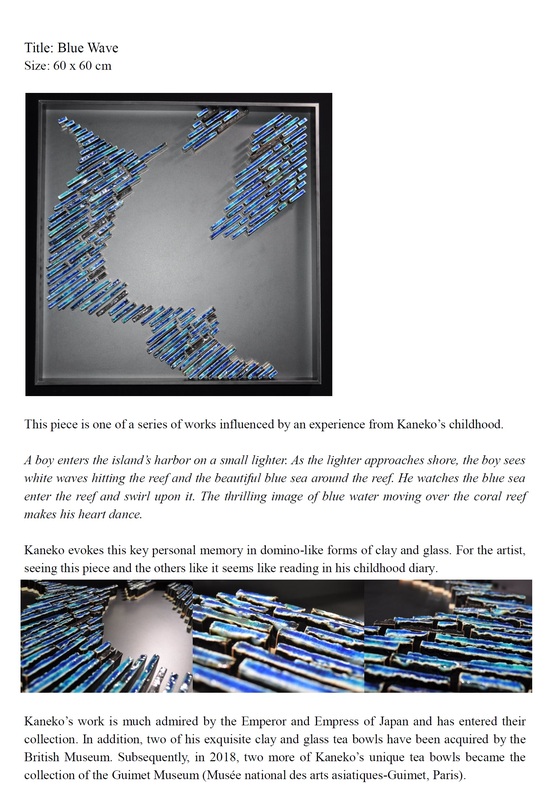 The miraculous fusion of glass and mineral breathe life into Ishigaki Blue. The lights that shined onto Ishigaki Blue not only reflect on its surface but also go deeper inside, as if to receive the message of hope and come out again. This doesn’t happen to ordinary tiles which just reflect light on its surface. This artwork also expresses the eternity of the ray of hope, as the reflections of light can be witnessed from every angles. Equally, the artwork represents the eternal prosperity by making the two pieces asymmetry. In Japan, asymmetry is used to express the incompleteness of all beings and the hope of eternal prosperity. Just like the Himeji castle, a Japanese national treasure, which has one of its roof-tile placed upside down intentionally, this artwork has two non-identical shapes. Each one of them is incomplete but when the two come together, they reach perfection. In October 2016, I participated in the Ceramic Art York 2016 held in York, UK. During the fair, officials of the York Museum visited my exhibition booth and saw my artworks. Early this month, I received a wonderful news from York that my artwork has been included as part of the “York Art Gallery’s collections”. I am so grateful for the development. 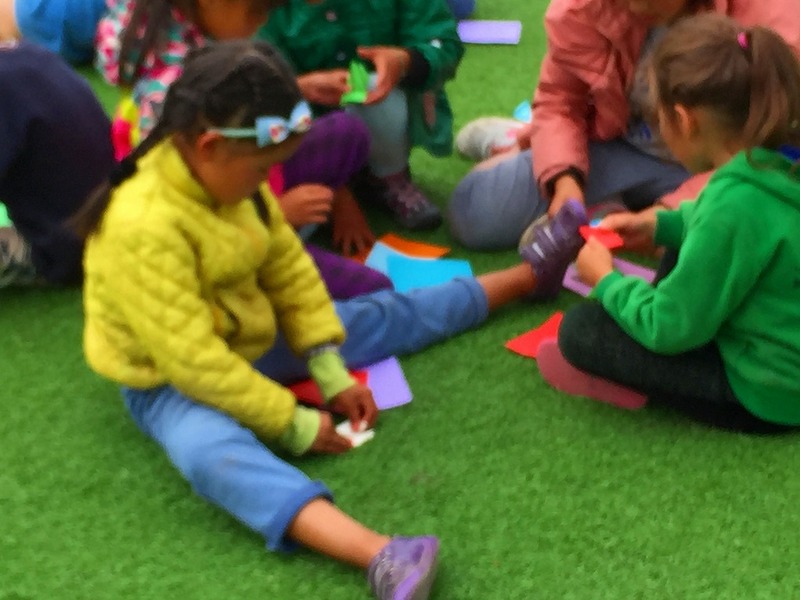 I am encouraged to create more pieces that can touch hearts of the people around the world. Please include the York Museum as part of your itinerary, whenever you visit UK. 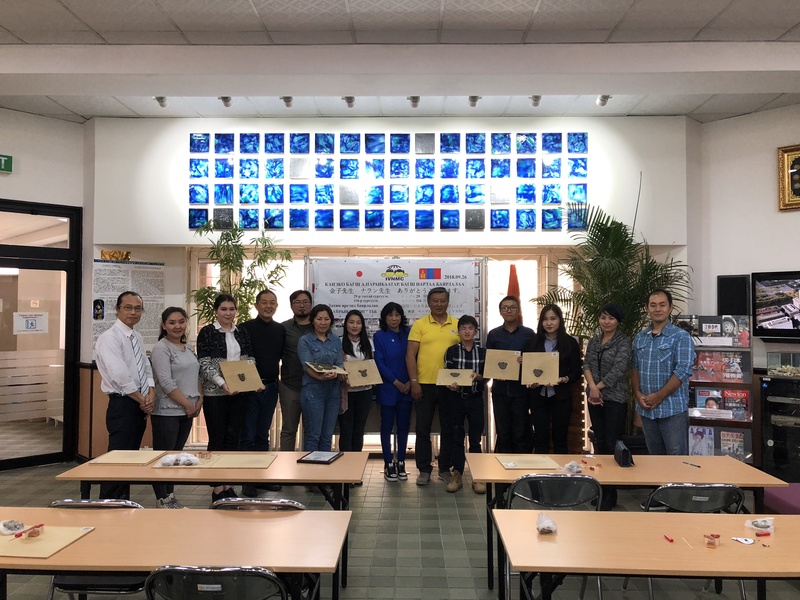 The Top 5 winners of the Miss International Beauty Pageant 2016 has visited Ishigaki-yaki Pottery Studio and joined our pottery workshop. Each of them enjoyed the unique pottery experience here in our Studio. They look forward to receive delivery of the pieces which will be completed with the colour of blue ? the colour that represents hope in Europe especially in France. Your piece will reach you soon! I will join the six-man exhibition organized by Gallery Atelier 28. I had a great time at the Ceramic Art York 2016, mingled with 41 wonderful ceramic artists from UK and other European countries;Peter Beard, Ashraf Hanna, Ruth King, James Oughtibridge, to name a few. I am really impressed with their professionalism and exceptional skills. I felt the presence of large ceramist talents in this country. I equally enjoyed the historical and cultural landscape of the city of York and its intelligent, warm-hearted people. I am so grateful for all visitors and even other artists who purchased my artworks. York became one of my favorite cities. My best wishes to other artists, the organizers and people in York! This summer Dutko Gallery will present Encounters, a vibrant panorama of Japanese art and decorative arts from the 1930s to today. For several centuries Japan has influenced the west, creating an important cultural bridge between East and West. Exploring this artistic exchange and the influences brought to Europe and beyond, this exhibition brings together exquisite examples of Japanese artistry and craftsmanship. As one of only a dozen others to use the ancient Uteki Tenmoku ‘drop of oil’ technique, master ceramicist Haruhiko Kaneko creates a rare luster and glaze in his elaborate sea inspired bowl and vase designs. Haruhiko Kaneko's Ishigaki-yaki pottery artwork will be exhibited at PAD Paris Art+Design in the Galerie JEAN-JACQUES DUTKO's booth No. 51. 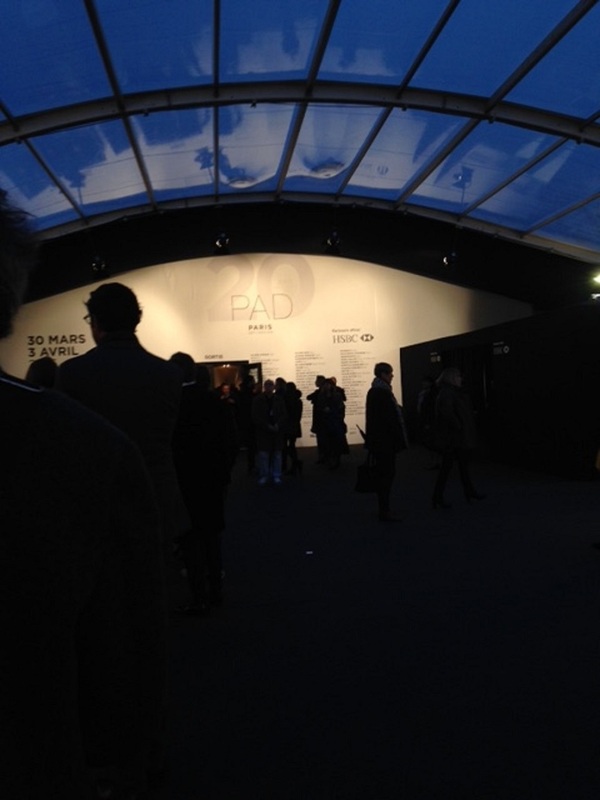 PAD Paris Art+Design will be held till 4 April 2016 at Tuileries Park near the Louvre Museum. You are all welcome to the fair! The Salon de Societe Nationale Des Beaux Arts a Carrousel de Louvre exhibition was held at the Carrousel de Louvre, a space beneath the Musee du Louvre in Paris, France, from 17-20 December 2015. The exhibition was organised and curated by the Societe Nationale Des Beaux Arts (SNBA, National Society for Fine Arts), one of the five most historical art academies in modern French history. The SNBA is now in its 154th year. It has long provided support to the central pillars of French arts, and in return has been the only academy to enjoy the support of successive French presidents. Its membership has included such notable artists as Marc Chagall, Claude Monet, Edouard Manet, Auguste Rodin, Pablo Picasso, and Pierre-Auguste Renoir. The list of Japanese artists who have been members includes Torajiro Kojima, Taikan Yokoyama, Tsuguharu Fujita, Seiki Kuroda, Kiyoshi Hasegawa, and Koji Fukiya. 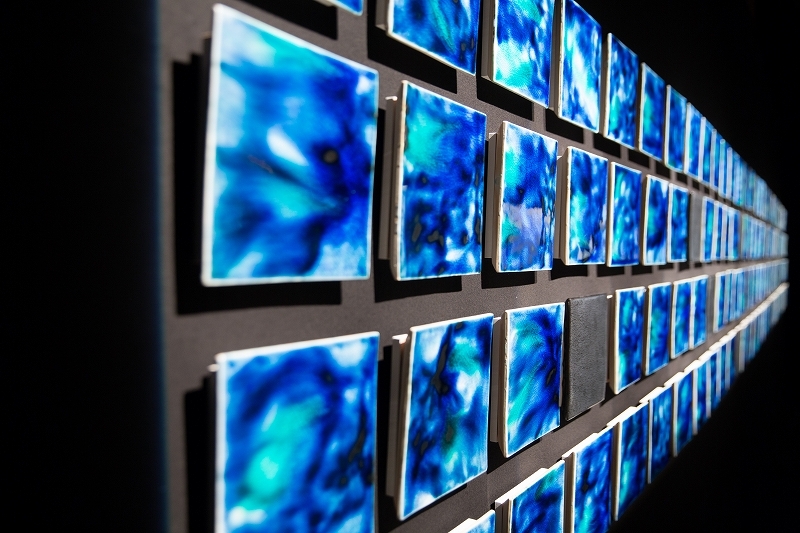 The juries who selected the artworks to be showcased at the 2015 exhibition were forthcoming with praise for Kaneko’s work, noting how his installation, a blue-coloured ceramic wall, had a quality of expression more associated with painting than ceramic works, and commenting on its striking individuality, something hitherto unseen in ceramic pieces. 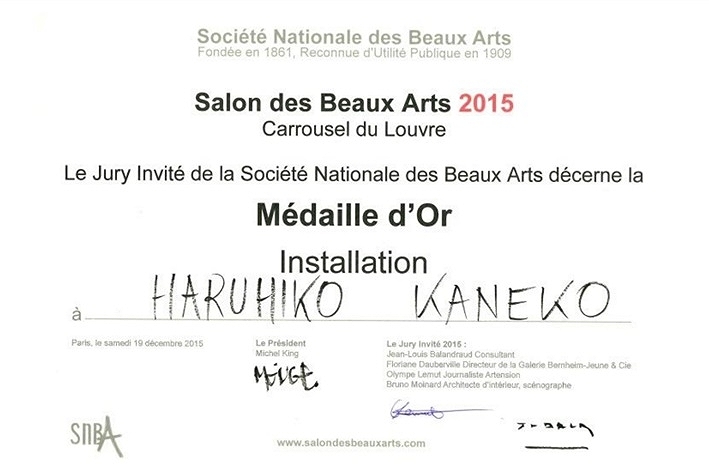 On the basis of this evaluation, Kaneko’s work was selected to represent Japan at the 2015 event, the first time a ceramic artwork has been chosen as to represent Japan and, as such, a true honour for the artist. 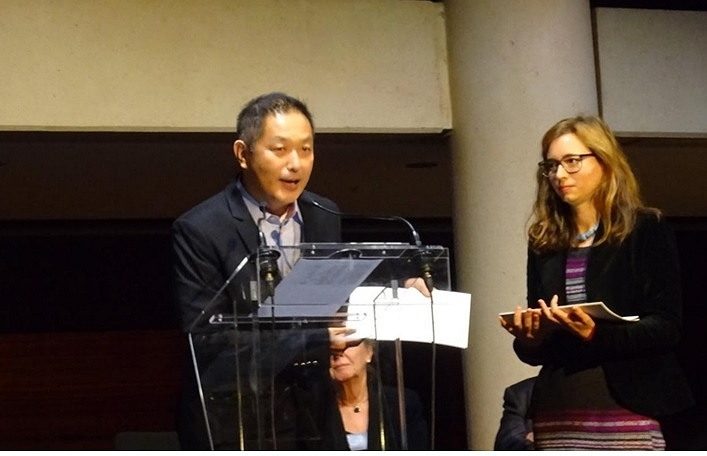 Furthermore, the artwork won two prizes at the exhibition: Le Jury de la Societe Nationale Des Beaux Arts decerne la Medaille d’Or d’Installation (Gold Medal for Installation selected by the Societe Nationale Des Beaux Arts Jury) and le Jury Invite de la Societe National Des Beaux Arts decerne la Medaille d’Or d’Installation (Gold Medal for Installation selected by the Societe Nationale Des Beaux Arts Invited Jury). 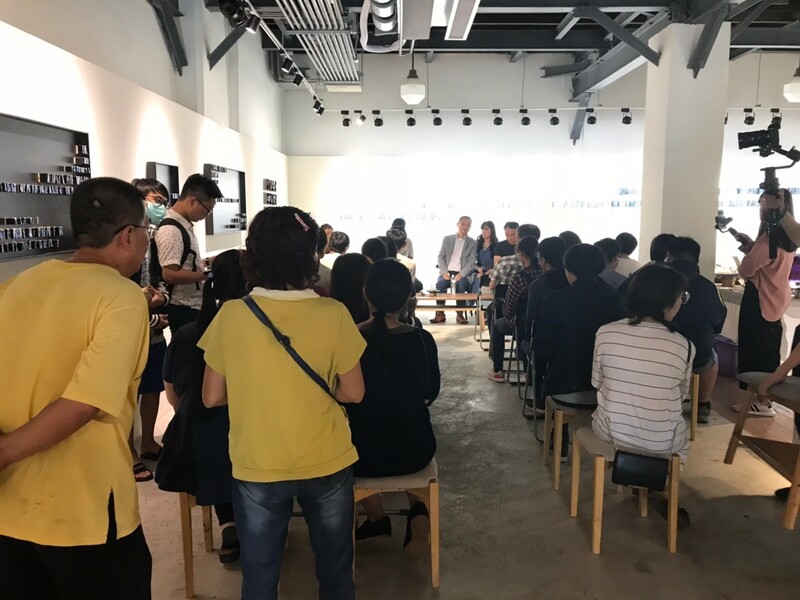 Both juries comprised curators, interior designers, architects, and other art and design professionals, all at the top of their respective fields. This year, the jury also included Bruno Moinard, the renowned architect and scenographer responsible for the design of multiple gallery spaces, particularly in Paris, of all Alain Ducasse restaurants, and of all Cartier boutiques. Of his latest success, the artist has said: “I would like to use this as a new starting point, from which I can focus on creating innovative new artworks. I hope to be able to enjoy everyone’s continued support”. 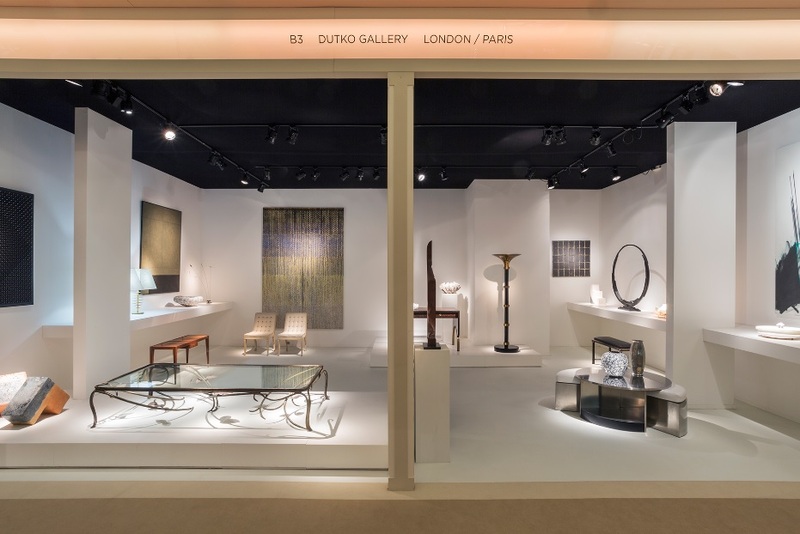 The second edition of Salon Revelations (the Revelations Fine Craft and Creation Fair), held in the Grand Palais, Paris, attracted more attendees than the inaugural event, with a total of 38,566 attendees, of which 33% were professionals and buyers. The 340 creators who exhibited at Revelations included 70 international creators from 17 countries worldwide, who had been selected to showcase their work. 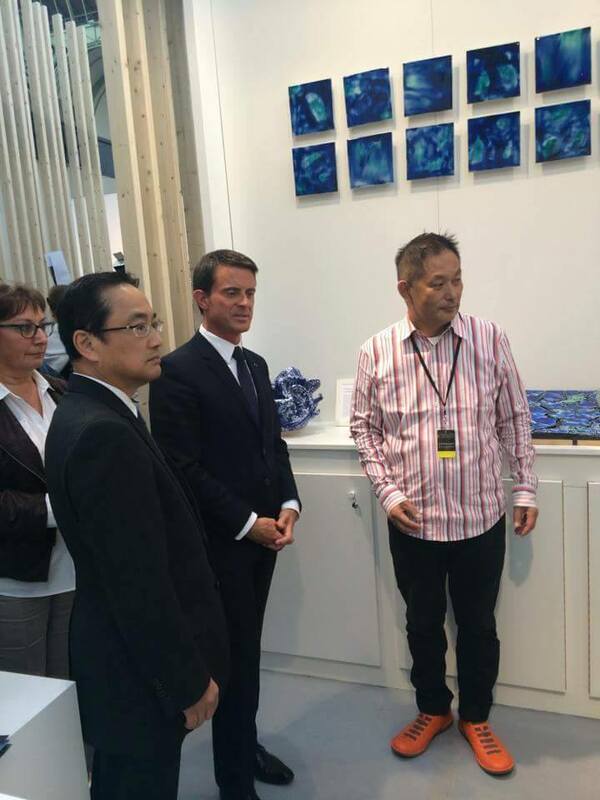 Haruhiko Kaneko, founder of Ishigaki-yaki Pottery, was honoured to receive a number of distinguished guests during the fair, including Prime Minister of France Manual Valls and Yoichi Suzuki, the Ambassador of Japan to France. 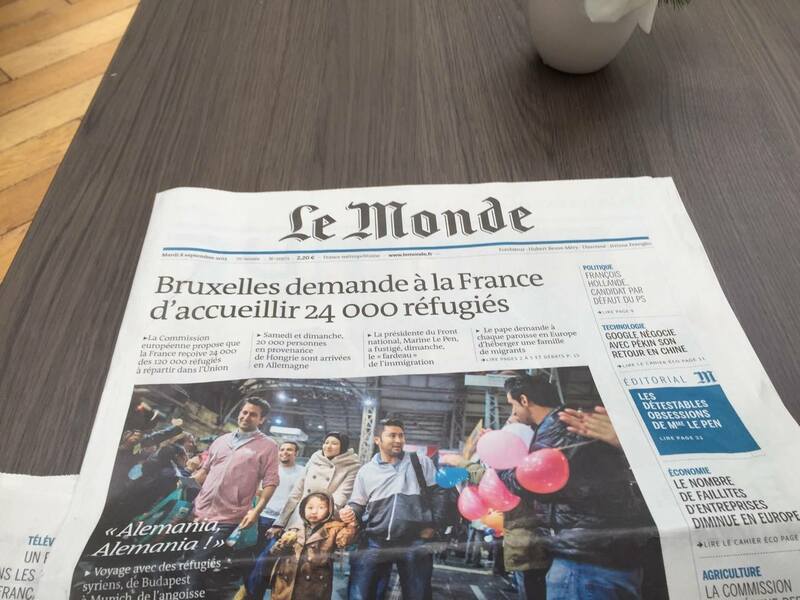 Haruhiko was also delighted to have his work introduced in leading French newspaper Le Monde. 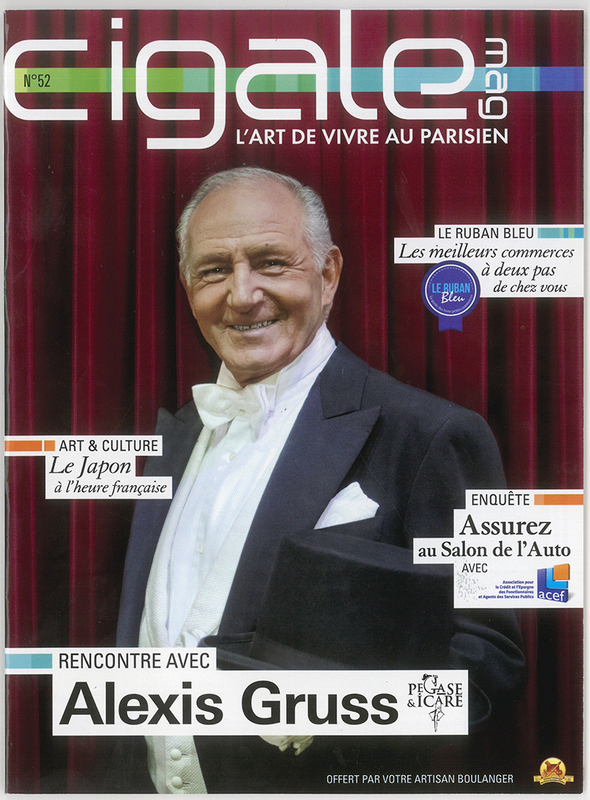 One French visitor noted how, in France, blue is considered to be the colour of hope. Hope, however fragile, is always needed in this world. She told Haruhiko, as an artist, he should consider it his mission to transmit hope throughout the world through the medium of his art. She looked happy as she spoke, with a blue Ishigaki-yaki pendant dangling around her neck. Another French visitor noted that blue as the colour of royalty and described Ishigaki-yaki serving ware as “fit for a king”. That visitor promised to use his precious Ishigaki-yaki pieces the next time he was welcoming important visitors. 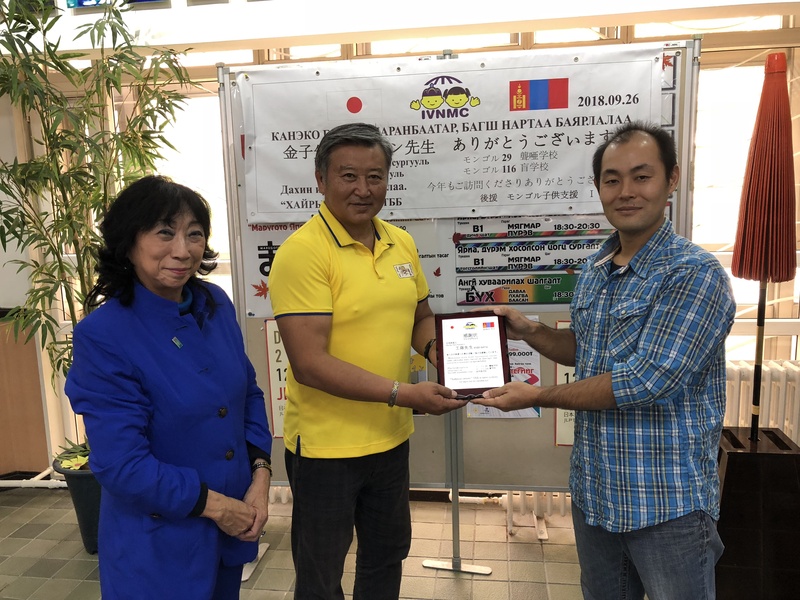 By the end of the fair, Haruhiko was convinced of his duty to continue to craft his “Ishigaki blue”, as a means of bringing joy and warm smiles to people around the world. Haruhiko is now more determined than ever to deliver to people around the world the happiness of Ishigaki blue. 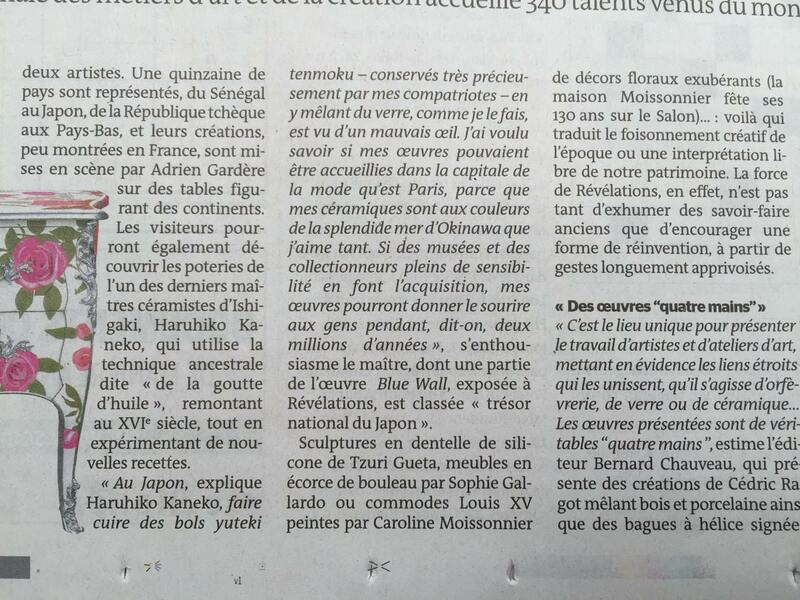 Haruhiko Kaneko, with his Happy Blue Wall, has been selected as one of the three Japanese artists making up the Artiste Regards Sur section of this notoriously selective event, organised by the Societe Nationale des Beaux Arts. This will be the first time in SNBA history that a ceramic piece has been selected to be part of the installation section. 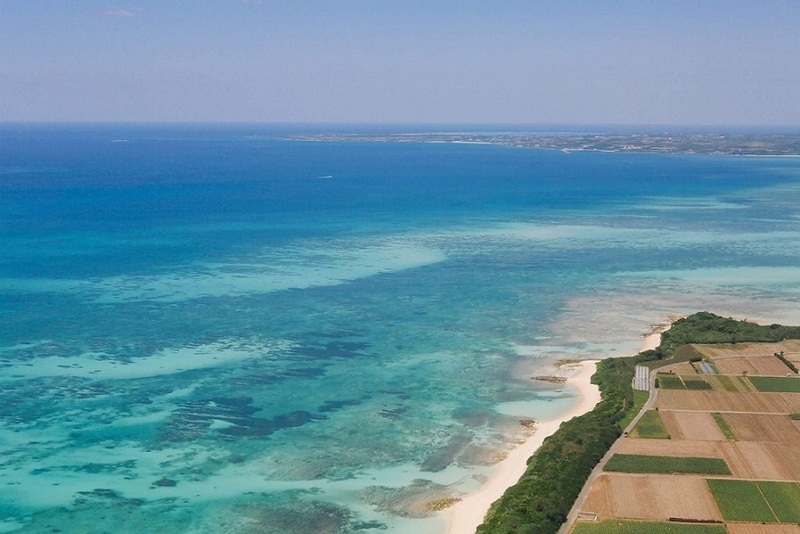 This is another chance to showcase the beauty and magnitude of Okinawa’s ocean waters. The artist is excited by this wonderful opportunity to introduce Happy Blue Wall to as many people from around the world as possible, and is looking forward to meeting many Salon visitors together with his ten-metre artwork. 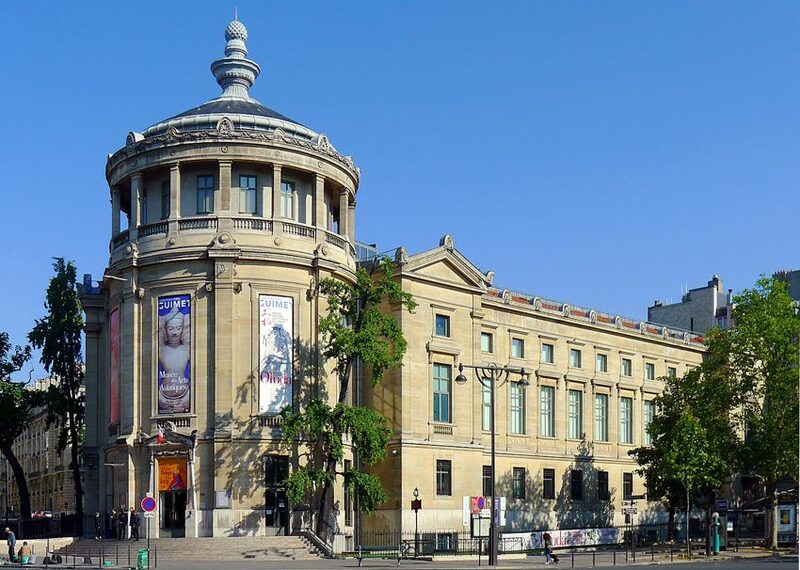 The Societe Nationale des Beaux-Arts (SNBA, National Society for Fine Arts) is one of the five most historical art academies from modern French history. Established 152 years ago, the SNBA carved out a reputation by being the most faithful, of the five main academies, to the French figurative art tradition. The SNBA has supported this central pillar of French art throughout its long history, and in return has been the only academy to enjoy the venerable support of successive French Presidents. 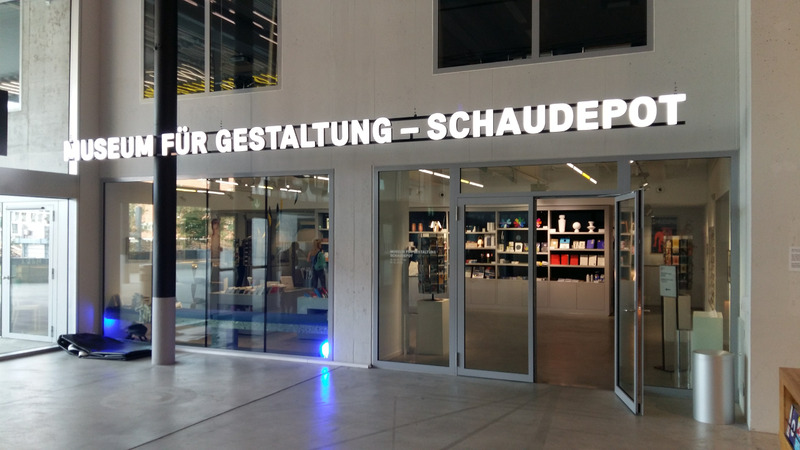 Its membership has included such notable Japanese artists as Torajiro Kojima, Taikan Yokoyama, Seiki Kuroda, and Tsuguharu Fujita, all of whom found the gateway to recognition in Europe opened through their participation in SNBA salons. 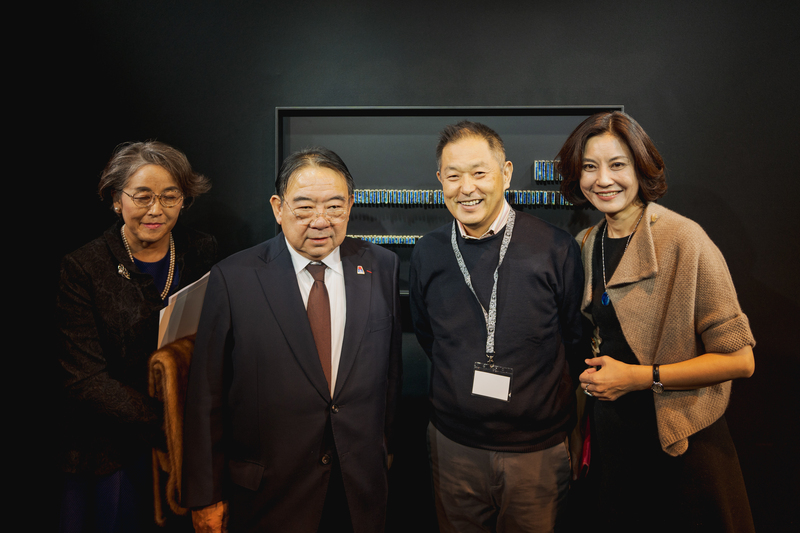 Today, the renowned Japanese artist Kojiro Akagi, who received the Award of the President of the French Republic in 1975 and was named a Knight of the Order of Arts and Letters of France in 2014, holds the position of honorary Vice President of the SNBA. The academy still upholds the founding principles of the French Republic?liberty, justice, and fraternity?as it continues to scrutinise would-be exhibition artwork with the strictest criteria, endorsing only those pieces of the highest international quality. The Salon Revelations au Grand Palais has evolved into a biennale, held once every two years. 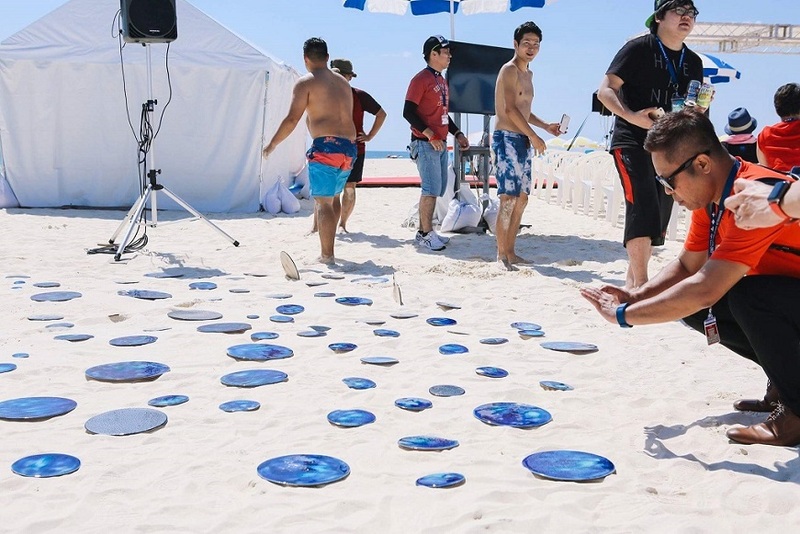 Ishigaki-yaki pottery has once more been chosen to be part of the event, with more pieces representing the beauty of Okinawa’s ocean waters. The artist hopes to be able to greet as many people as possible at this wonderful Paris exhibition. 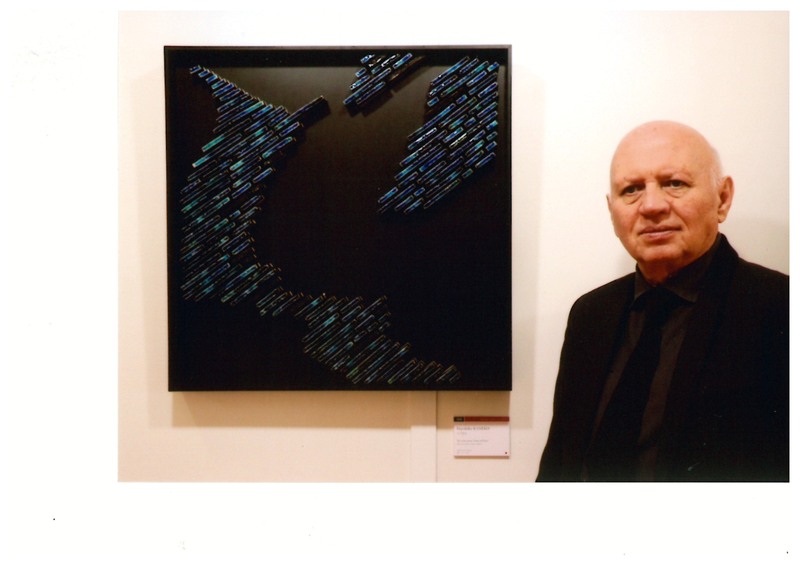 Please do come and visit the artist and his artwork at the Grand Palais in Paris. This biannual event is a large-scale arts and crafts exhibition organised by the Ateliers D’Art de France, a foundation dedicated to the craft professions with a membership of over 6,000 professional artists and craftspeople, including French living national treasures, Meilleurs Ouvriers de France (MOF, contemporary craftspeople recognised as having outstanding skills), master craftspeople, and leading artists in their fields. International artists seeking to take part are expected to have examples of their work featuring in the permanent collections of world-renowned galleries or museums. After World War II, most exhibitions featured only galleries, rather than individual artists, leading to concern that such practice would limit the opportunity for talents artists to become recognised. At the same time, ceramics were falling into decline, prompting a return to the idea that “beauty is created by the individual”, and a subsequent resurgence of the idea that exhibitions should focus not on collections by galleries, but rather on the artists as individuals. Revelations is the foremost event in France for leading arts and crafts. It is characterised by its focus on artists and their artwork; the minimum requirement to exhibition is that an artwork should be the product of a traditional craft, that it should be the product of outstanding skill, and further that it should be exceptional as an artwork. As such, it is notorious in France for its extremely strict selection process. Artists who have been selected in the initial screening must then undergo a secondary assessment, conducted by twelve arts-related organisations (e.g. Sevres Ceramics Museum). The first edition of Revelations saw 300 artists from the world selected to exhibit. 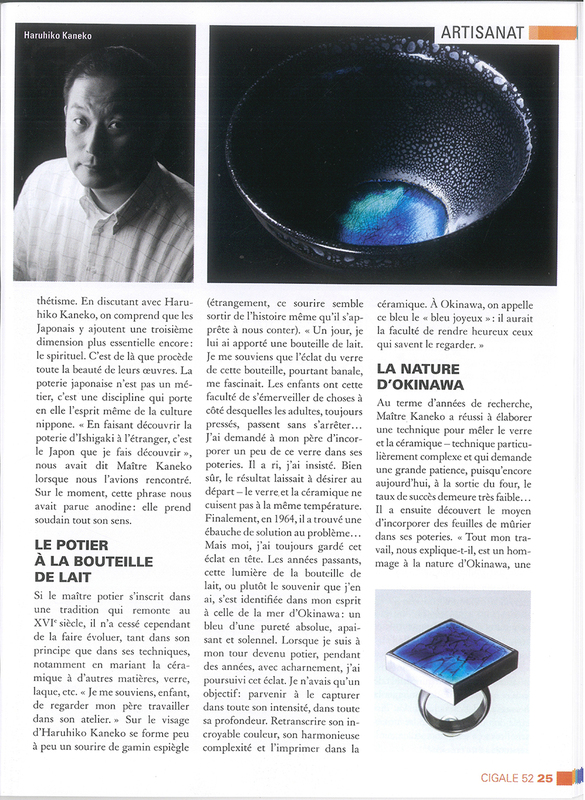 Haruhiko Kaneko, founder of Ishigaki-yaki Pottery, was the only Japanese artist officially selected to appear in the 2013 edition of Salon Revelations au Grand Palais. 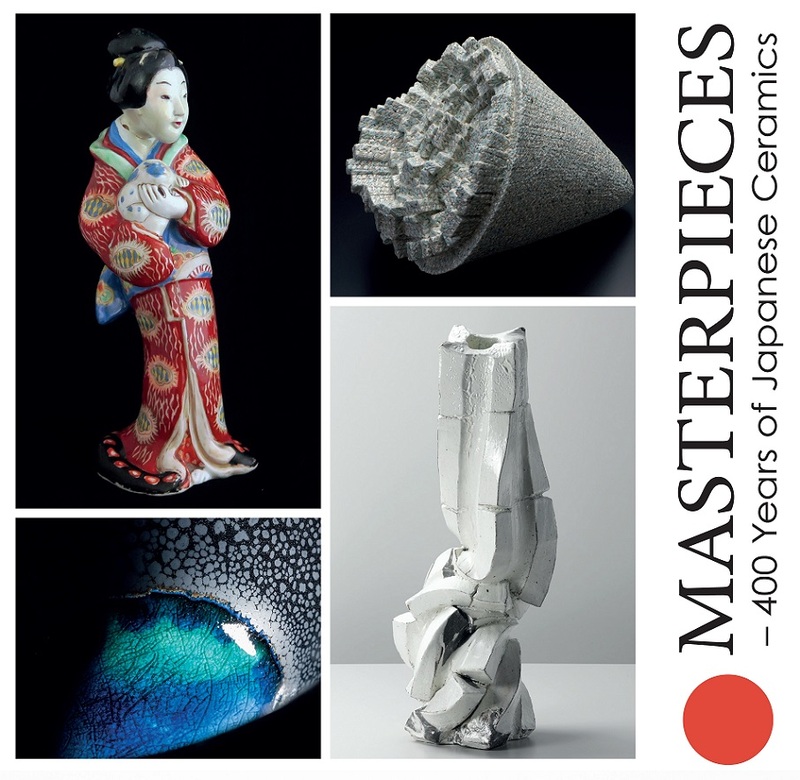 In 2014 the founder of Ishigaki-yaki Pottery, Haruhiko Kaneko, was invited to hold an exhibition at the Maison de la Culture du Japon a Paris (MCJP, a cultural centre supported by the Japan Foundation) in Paris, France. 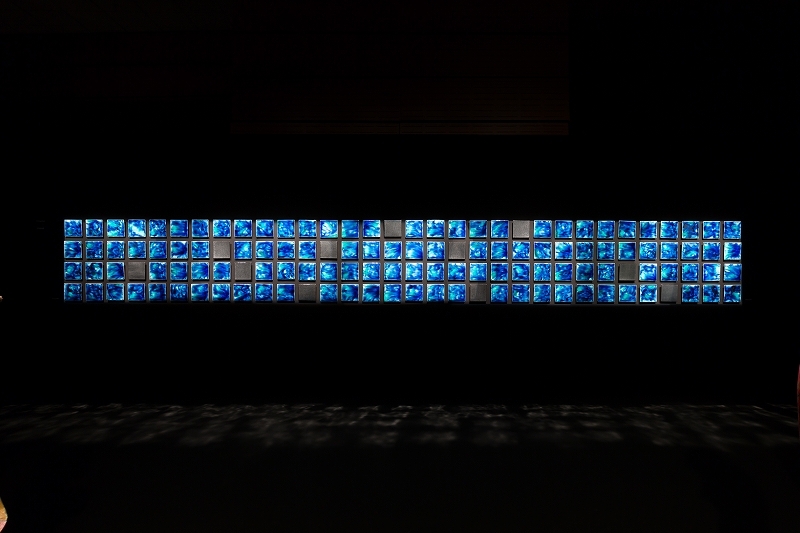 The exhibition, held in the first floor lobby of the centre, featured a 9 metre installation entitled Happy Blue Wall. 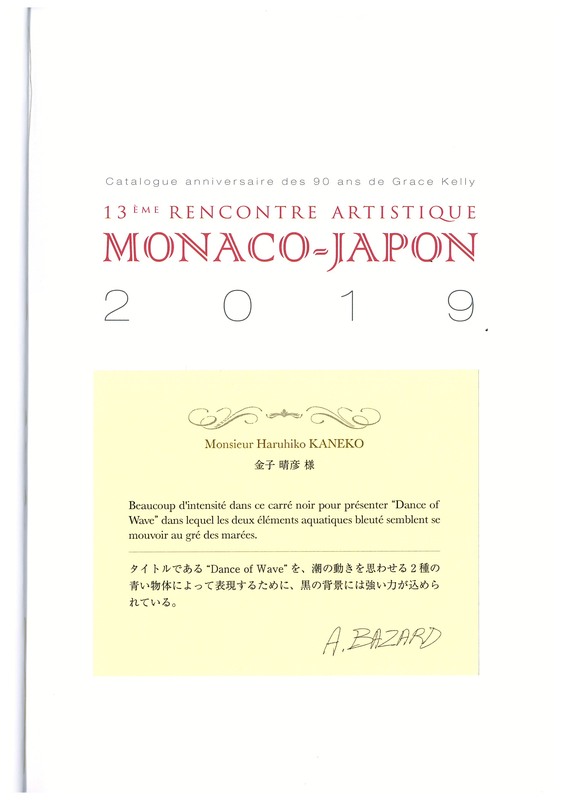 The artist is proud to announce that this installation has now been designated Japanese national property by the Japanese Ministry of Foreign Affairs, and will be kept at the Consulate General of Japan in Marseille. 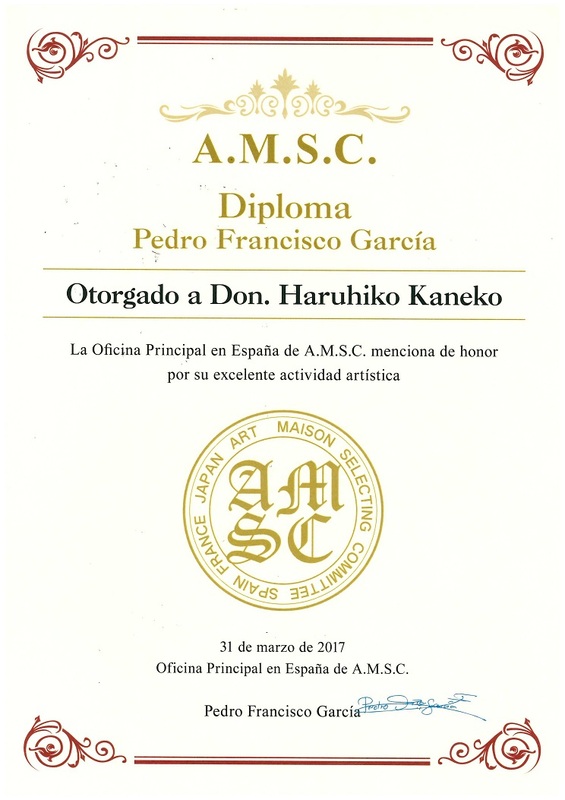 Having been recognised with this great honour, the artist will continue to place his Japanese identity at the forefront of his efforts to use culture as a tool for exchange and integration with the global community, and in doing so serve as an example to children as to what they might achieve in the future. Art in Clay. 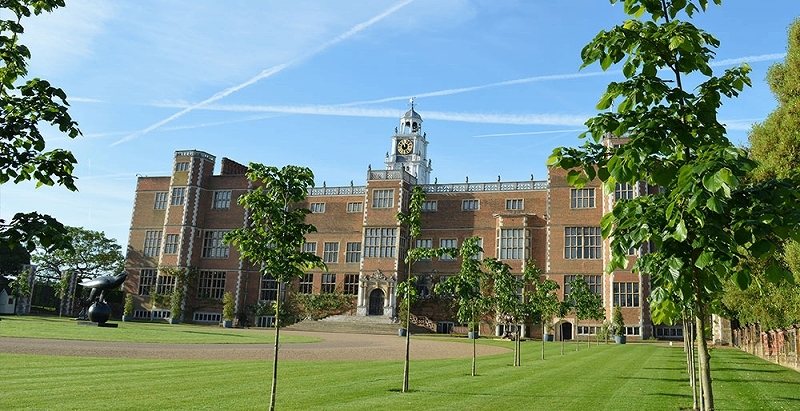 Celebrating 21years of Art in Clay at Hatfield House in 2015, this show has become one of the most important ceramic events in Europe. I am hoping to make many new friends and new collectors in England this coming summer. 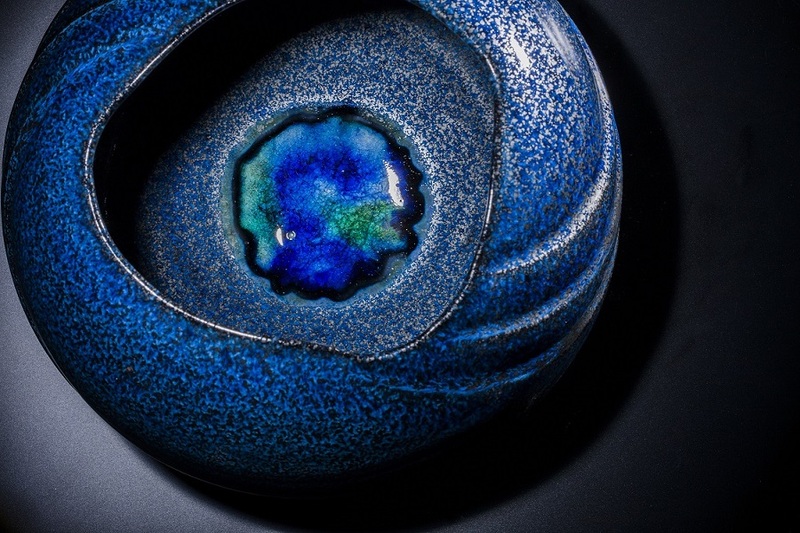 This is the first time Ishigaki-yaki pottery will be unveiled in the UK. Our tableware especially, is not normally exhibited and sold in foreign countries. Please do not miss this opportunity to visit us during the show. It will be a pleasure to meet you in Hatfield 2015. Thank you very much for visiting Ishigaki-yaki Pottery Studio. So many customers ask us to exhibit our artwork in Tokyo. We are very glad to do our solo exhibition in Ginza Tokyo for the third time. Ginza is a prestigious place, where only the best artists are offered to present their works. Please feel free to visit us at any time. My wife and I look forward to seeing you at the gallery. The side of 1F, Dai-ichi Iwatsuki Bldg. Please walk by Namiki Douri. It is in front of Tennich Tenpura Restaurant. Ishigaki-yaki pottery is showcased at the Japan Pavilion. 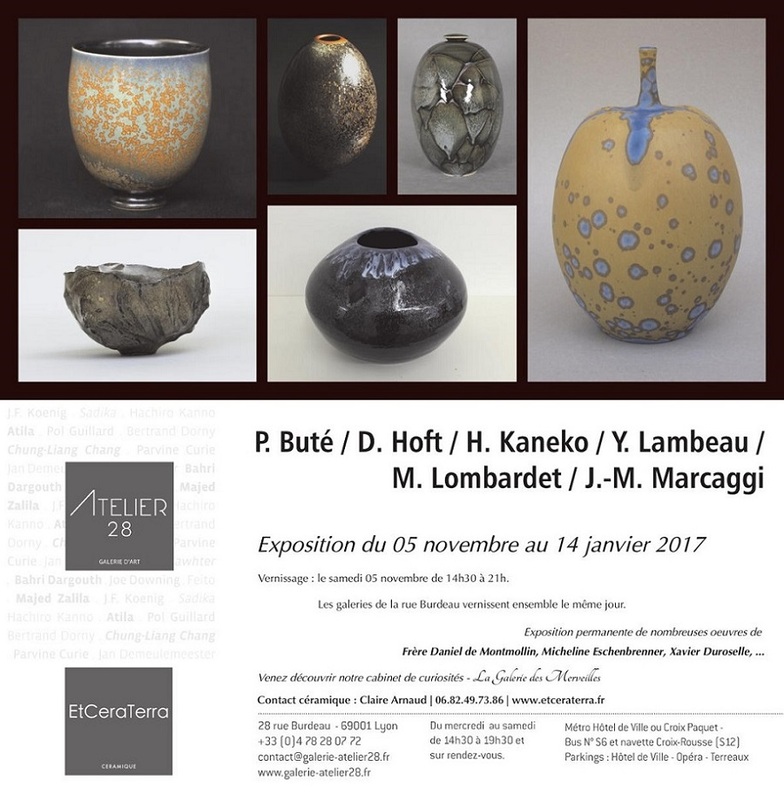 A solo exhibition by Haruhiko Kaneko, founder of Ishigaki-yaki Pottery, was held to great success at Villa Bagatelle in Marseille, France. 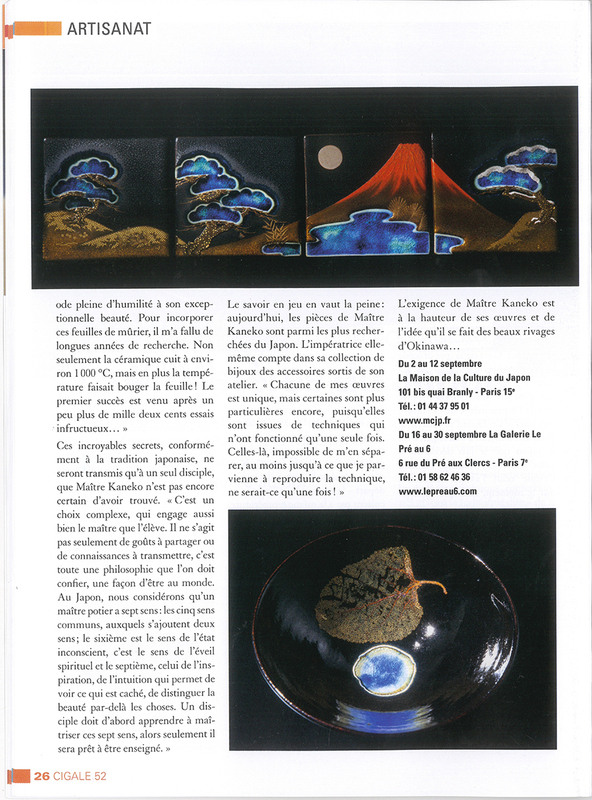 The exhibition was supported by the Consulate General of Japan in Marseille. A private view was held on the beautifully sunny evening of February 28. 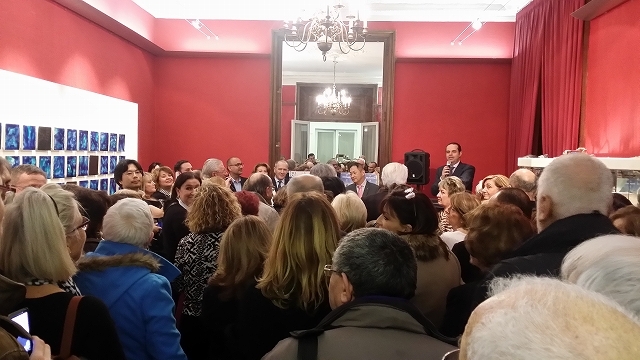 The many attendees included consuls and consulate staff from a number of foreign consuls, representatives of Marseille City, and members of the general public. 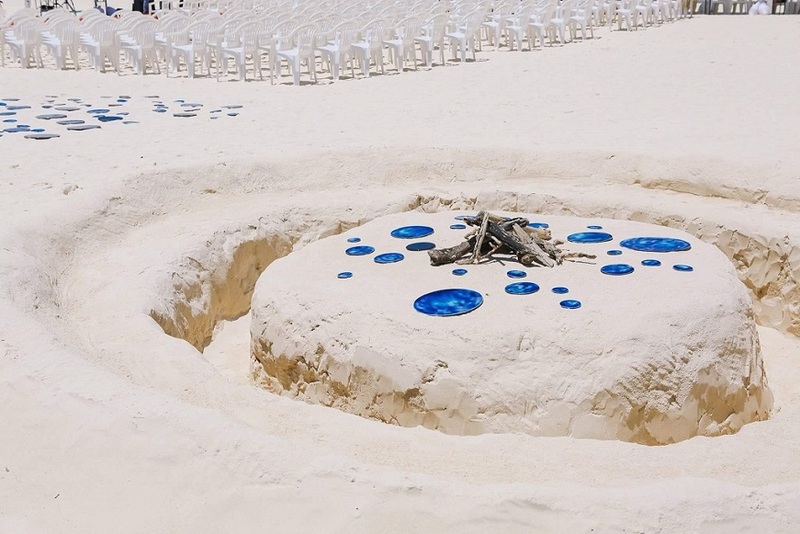 The exhibition, which comprised the Happy Blue Wall and several Ishigaki-yaki pottery pieces, received considerable praise, and the artist was delighted to have communicated the beauty and the importance of Okinawa’s ocean waters to a French audience. 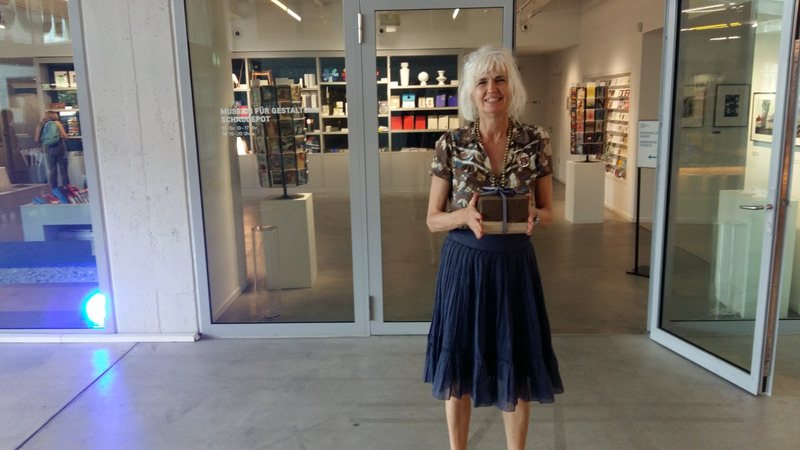 The artist was presented with a medal of honour by the City of Marseille. 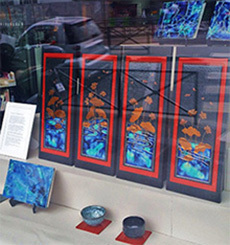 An exhibition of artwork by Haruhiko Kaneko, also known as the founder of Ishigaki-yaki Pottery Studio, was held in the Galerie Le Pres Au 6 in Saint-Germain-des-Pres, in the 7th arrondissement of Paris. 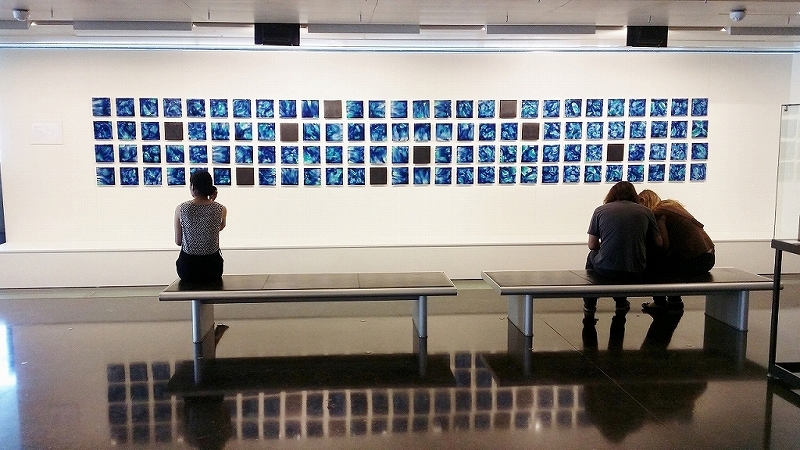 The theme of the exhibition was the colour blue, centering around a ‘Happy Blue Wall’. The exhibition, which ran for almost two weeks, kicked off with a well-attended private view on September 16th. 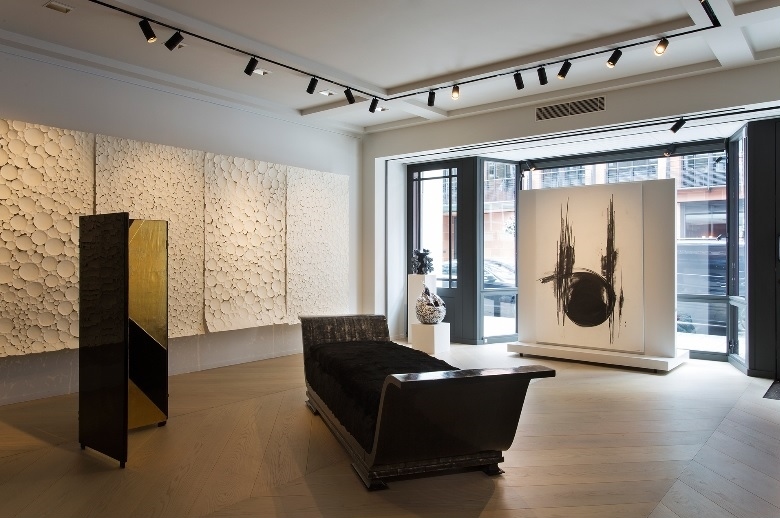 As well as pieces by Haruhiko Kaneko, the exhibition also featured luxury accessories by Masayo Kaneko and collaborative pieces resulting from a creative partnership between Haruhiko Kaneko and Kaga maki-e lacquerware artist Mitsuhiko Takada. 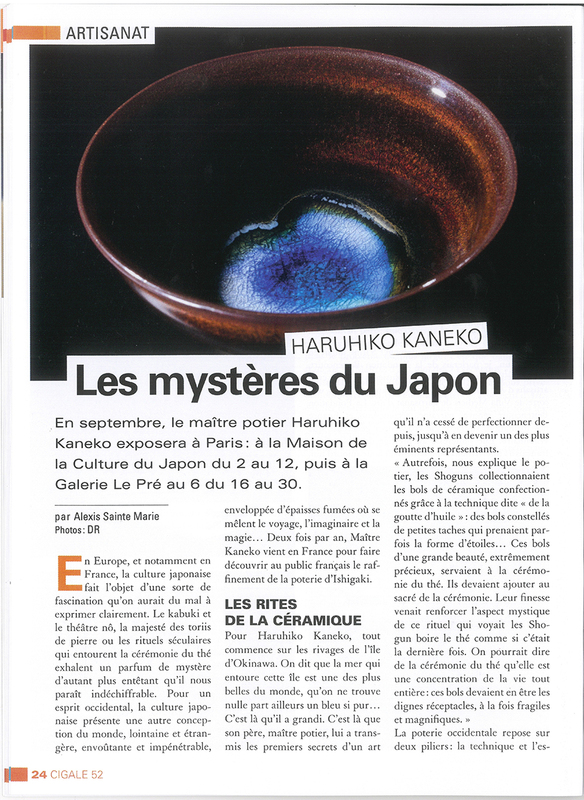 2-13 September, 2014 Haruhiko Kaneko Exhibition held at Maison de la Culture du Japon a Paris (Japan Foundation). 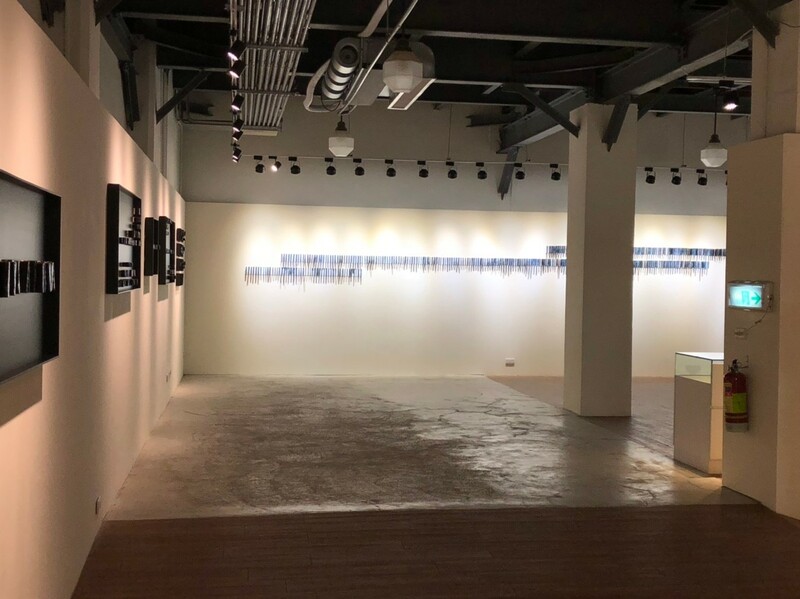 The opportunity to hold a solo exhibition at this venue is normally only offered to artists and craftspeople who have been designated by the Government of Japan as living national treasures. As such, this was an extremely rare event, comprising a number of stunning exhibits, including the nine-metre wide ‘Happy Blue Wall’, masterful tea bowls, and contemporary pieces. 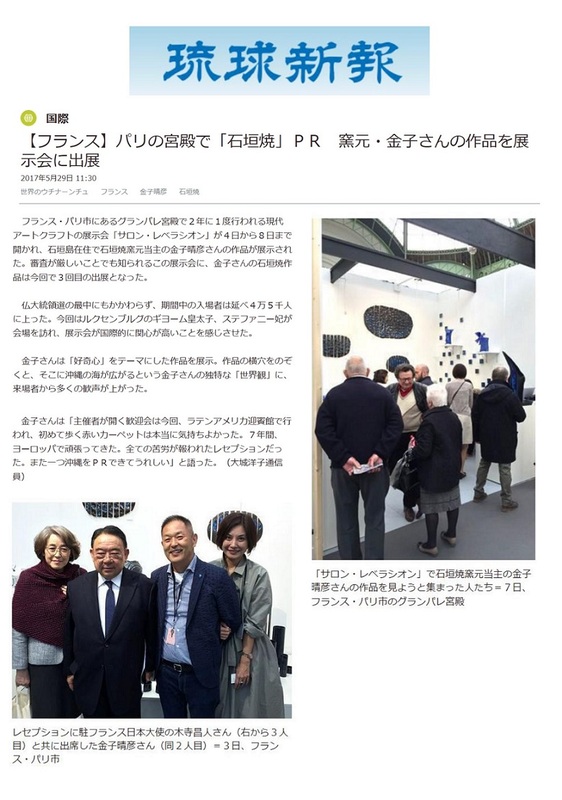 Luxury accessories by Masayo Kaneko and collaborative pieces with Kaga maki-e lacquerware artist Mitsuhiko Takada were also exhibited in the same space, and were the subject of considerable interest among visitors. 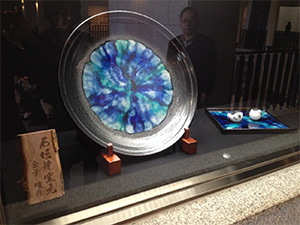 The Shimonoseki City Art Museum procured two pieces of Ishigaki-yaki pottery for one of its permanent collections: Umi, a large circular plate, and a large square dish, as well as two reproductions of the fukufue, a type of ocarina first launched as a popular product in 1935 by a Shimonoseki City businessman Kojiro Kawamura and intended to be a symbol of the city. However, only a few of these ocarinas, originally known as fugufue, remained, and the instrument was under threat of becoming forever lost. A number of Japanese ceramists had previously attempted to reproduce the fugufue but none had been successful until Haruhiko Kaneko. His reproductions, now renamed fukufue, together with the knowledge required to reproduce the instrument, were bestowed to the City Museum. Kojiro Kawamura was an entrepreneur born in Shimonoseki City who supported and nurtured many artists. Artists under his patronage included Ryusei Kishida, Ryuzaburo Umehara, Leonard Tsugouharu Foujita, and Yasuo Kazuki, who all worked in the youga or Western style of painting; Hokkai Takashima, who specialised in Japanese style painting; and Yumeji Takehisa, a painter and poet. 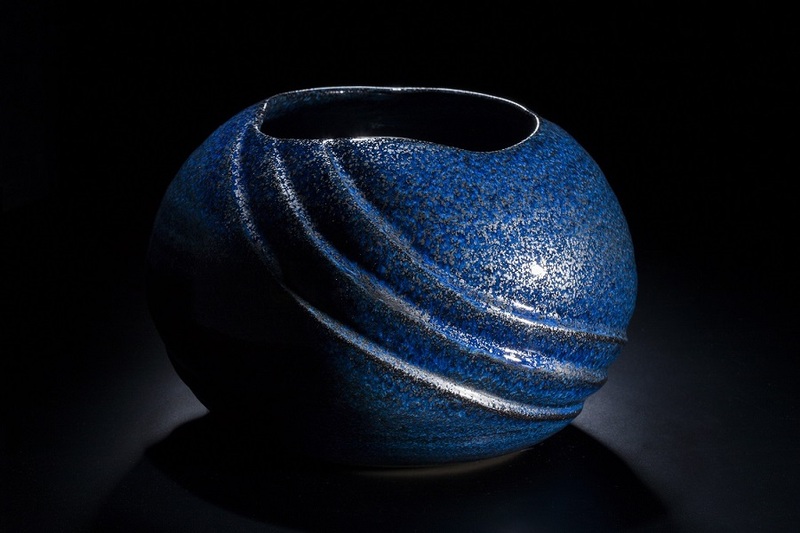 The pieces by Haruhiko Kaneko, President and founder of the Ishigaki-yaki Pottery Studio, are now part of the Kawamura Collection at the Shimonoseki City Art Museum. Salon RELEVATIONS ? 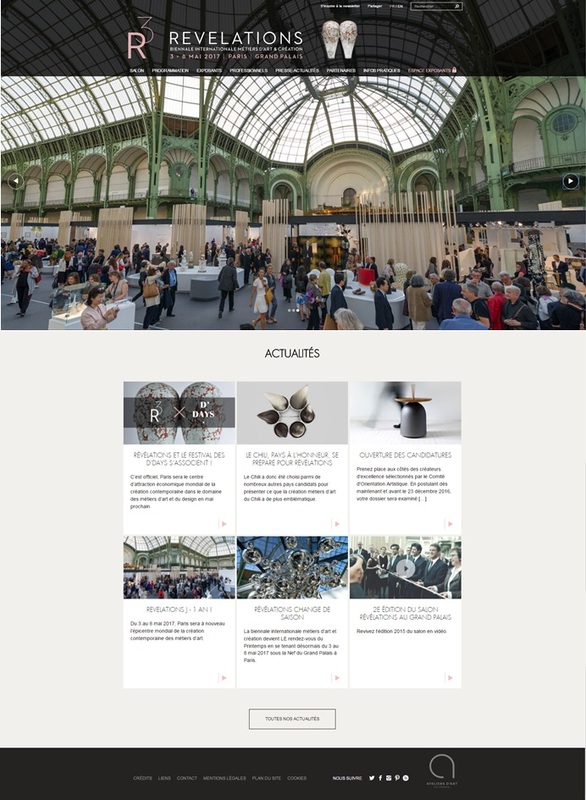 GRAND PALAIS was held to great acclaim from 11-15 September, 2014. This was the first Salon RELEVATIONS ? GRAND PALAIS to be held in France. The first day was met with long queues and a wait of around one hour to gain entry to this exhibition, and welcomed a number of distinguished guests included members of the Royal Family of Norway. With over 33,000 visitors across five days, the exhibition proved itself to be one of Europe’s finest. Around 300 artists from 100 companies around the world were selected to participate in the exhibition. 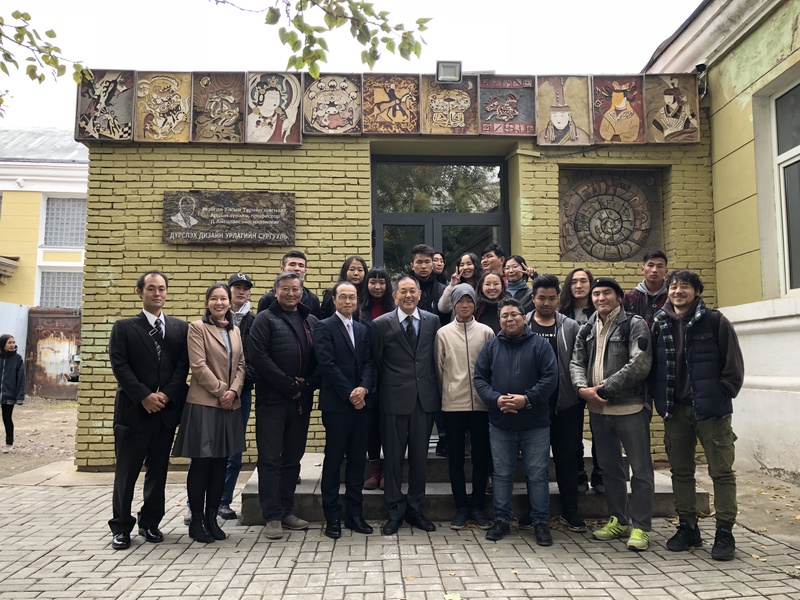 Haruhiko Kaneko and Ishigaki-yaki Pottery Studio were chosen to fill one of the limited places (30 companies, 100 artists) for international participants. 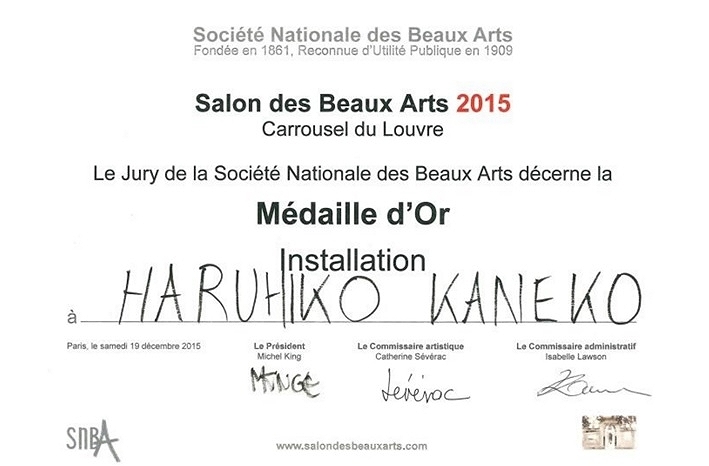 Haruhiko Kaneko was particularly honoured to be the only artist selected from Japan to be a part of the exhibition. French participants included several Un des Meilleurs Ouvriers de France (MOF, contemporary craftspersons recognised as having outstanding skills) and craftspeople and artists designated as living national treasures. The Ishigaki-yaki Pottery Studio stand welcomed an endless stream of visitors, including many Parisian locals. The Studio was also delighted to welcome Miss France, the winner of Miss International 2012, to the stand. 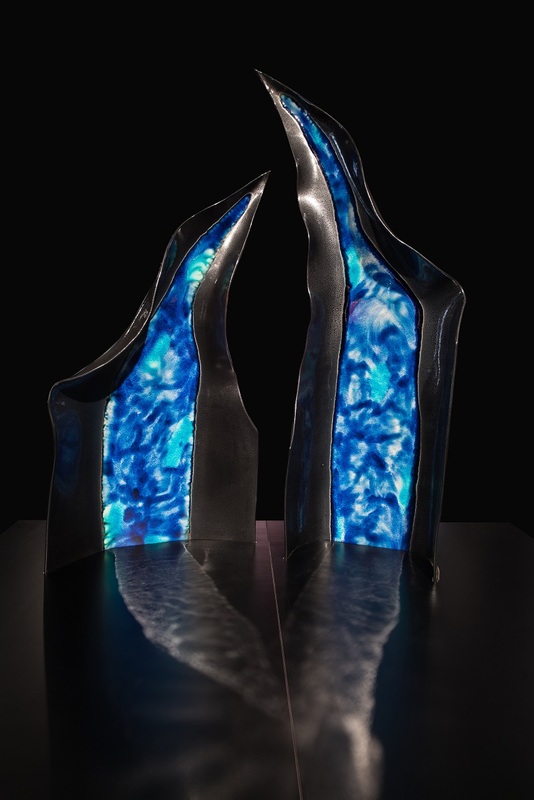 The three-part work, Hokuto Shichisei (The Big Dipper), a multimedia piece combining Kaga maki-e lacquerware, ceramic, glassware, and pearl, was selected to become part of the permanent collection of the Ateliers d’Art de France. 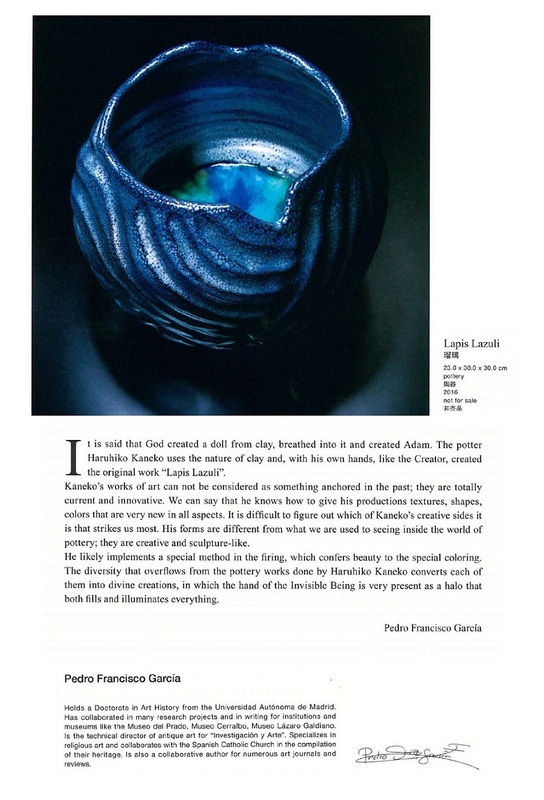 Kaneko’s artwork prompted the interest of the Master Alliance of Ceramic Art in China, which has subsequently exhibited two pieces?one yohen-taihi tenmoku tea bowl with characteristic iridescence and oil-spatter pattern and a yuteki tenmoku tea bowl with a characteristic black glaze?in the Tao Art Gallery in Shanghai, and continued to exhibit the pieces at various shows throughout China until the middle of October 2014. 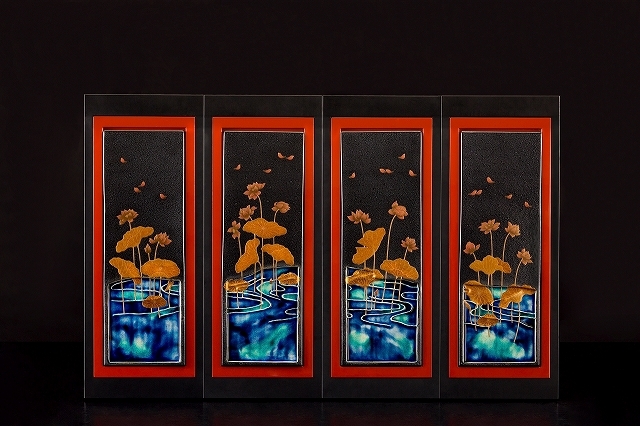 The exhibition was also the first showcase anywhere in the world of two new collaborative pieces, made with glass, ceramic material, and Kaga maki-e lacquerware: Fujin, Raijin (God of Wind, God of Thunder) and Shunka Shuto (Four Seasons). These pieces have also been shown as part of the subsequent exhibition Kanazawa: Origins of a Samurai Culture, alongside personal items of Toshiie Maeda, one of the most powerful generals to serve under Nobunaga Oda in the sixteenth century. 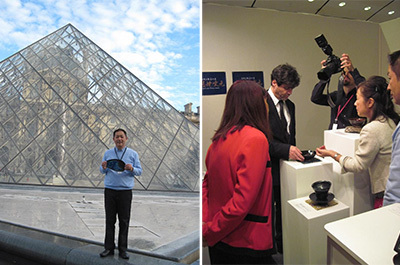 The SALON INTERNATIONAL DU PATRIMOINE CULTUREL (International Heritage Show) was held in the Carrousel du Louvre in Paris from 8-11 November 2012. 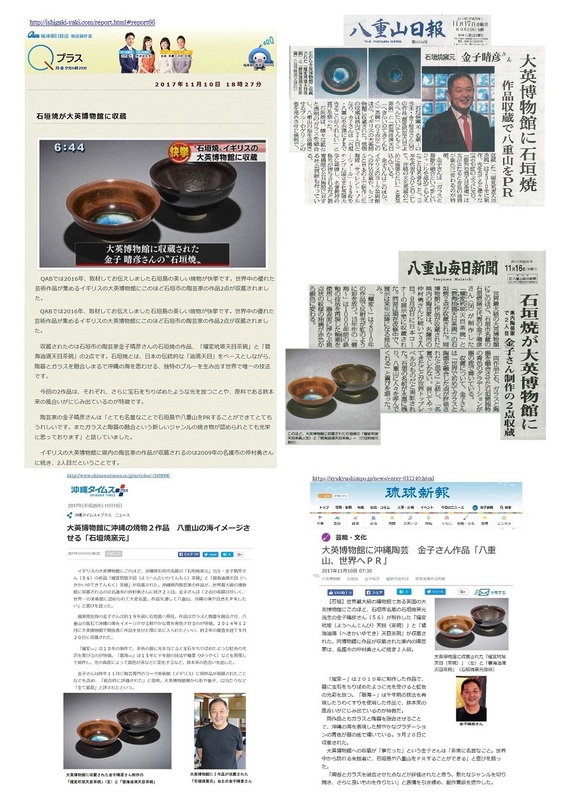 The event was a perfect platform on which to showcase yohen-taihi tenmoku tea bowls (with characteristic iridescence and oil-spatter pattern) and hekikai konoha tenmoku tea bowls (a fusion of glass, pottery, and tree leaf). Happily the visitors, who included tourists, collectors, art historians, and wealthy individuals, appeared unanimous in their admiration for Kaneko’s exhibits. The Carrousel du Louvre is located below the Musee du Louvre and is part of the palace. It is well known for being the location chosen by Chanel to showcase its new collections twice each year. 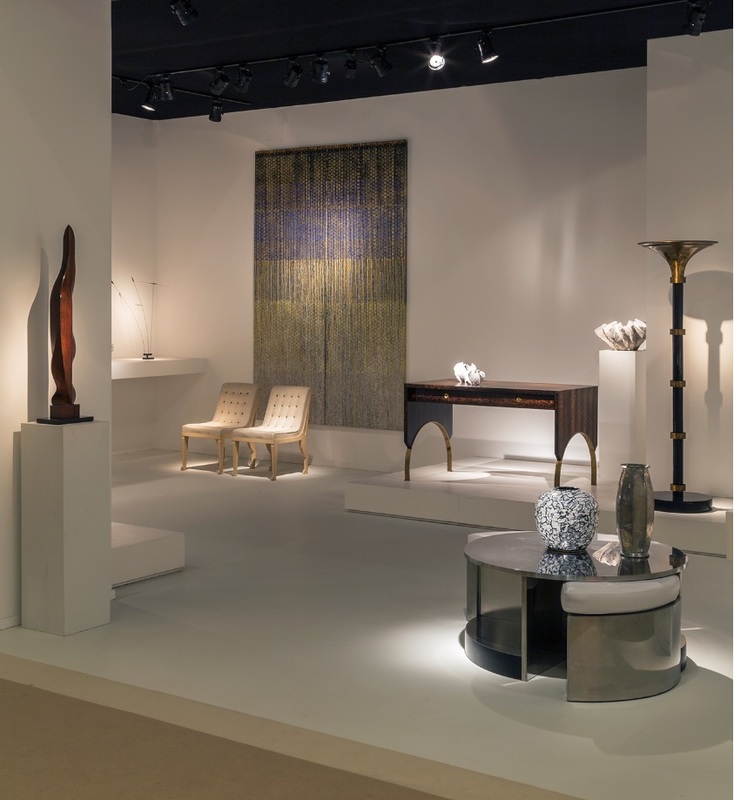 Participation in the show is by strict selection only; participants in 2012 included a number of Un des Meilleurs Ouvriers de France (MOF, contemporary craftspeople recognised as having outstanding skills), and craftspeople designated as living national treasures. The event is a wonderful opportunity to view outstanding French craftsmanship, including lace, stained glass, and reproductions of 12-13th century ceramic plates. 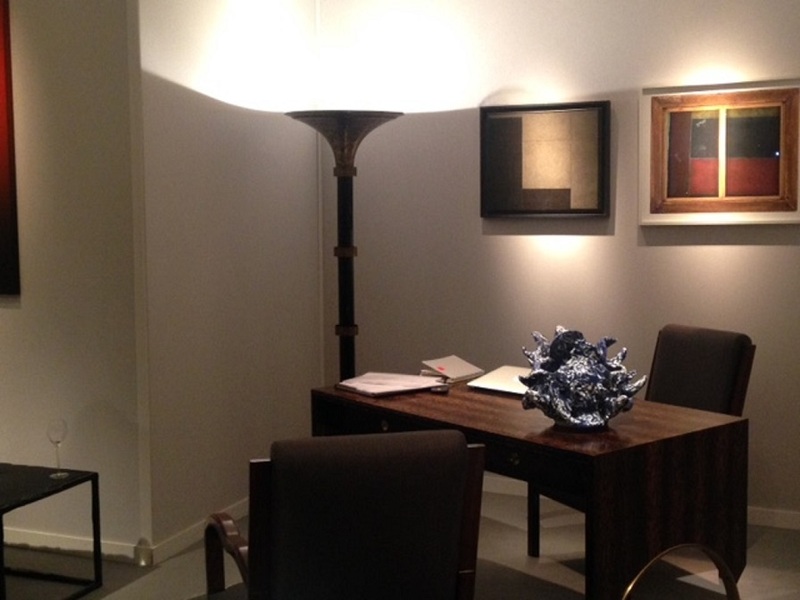 Maison & Objet, held annually in Paris, is one of the world’s most renowned trade fairs. It is said to be the “Paris collection for interior design”, and is considered to be an important gateway to international recognition and success. Only two Japanese companies have exhibited artworks in the Craft hall (Hall 4) for three consecutive years; one of those is Ishigaki-yaki Pottery Studio. 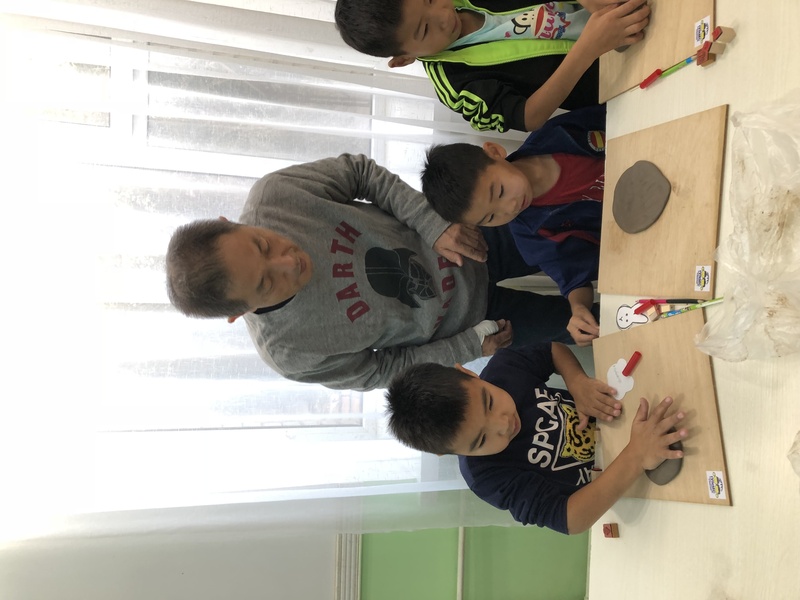 The studio has not exhibited since 2013, but the three years Ishigaki-yaki Pottery Studio participated in the event were formative, helping to shape the path which the studio is now taking towards the future. 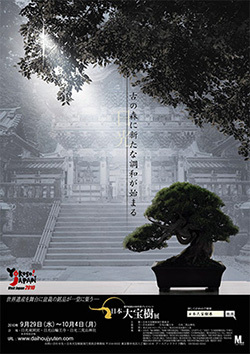 This rare exhibition celebrated some of the oldest and most valuable bonsai trees in Japan. Many of the bonsai had never been viewable by the general public before, making this a must-see event. These priceless bonsai were displayed among ceramic art created by living national treasures, with some pieces valued at millions of yen. 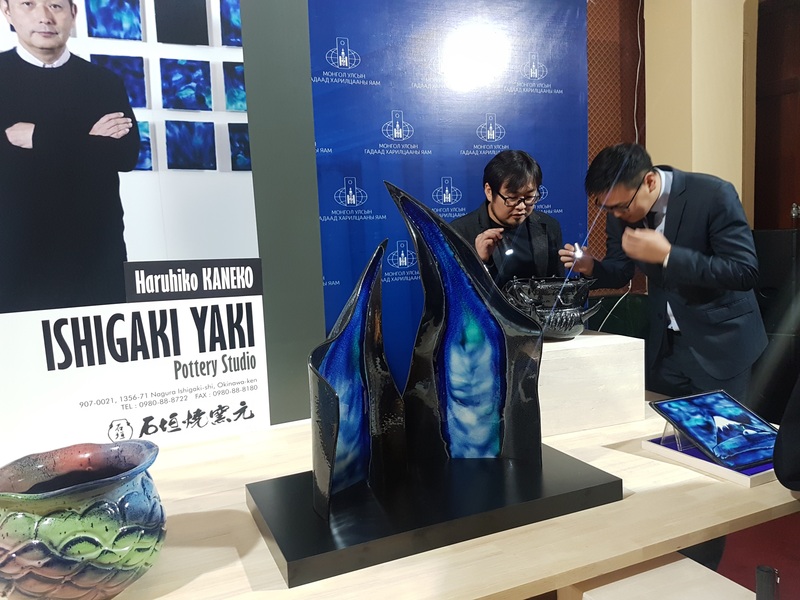 To the delight of Ishigaki-yaki Pottery Studio, pieces by Haruhiko Kaneko were also selected to be part of the exhibition and were displayed alongside masterpieces by living national treasures. Some of the bonsai were well over 500 years old, still others close to a thousand, yet thanks to the formidable knowledge of the bonsai experts who have cared for the trees over time, none of them is more than one metre in height. Bonsai can encapsulate many things: a cosmic view, a sense of time, and a sense of seasonality. Bonsai owners would only pass their precious trees into the care of someone who shared the same philosophy and beliefs. As such, they are expressions of great and mutual respect over the centuries. The exhibition was held in the Kyakuden Guest Hall, where the Emperor and Empress of Japan have stayed as well as other members of the Imperial Family. 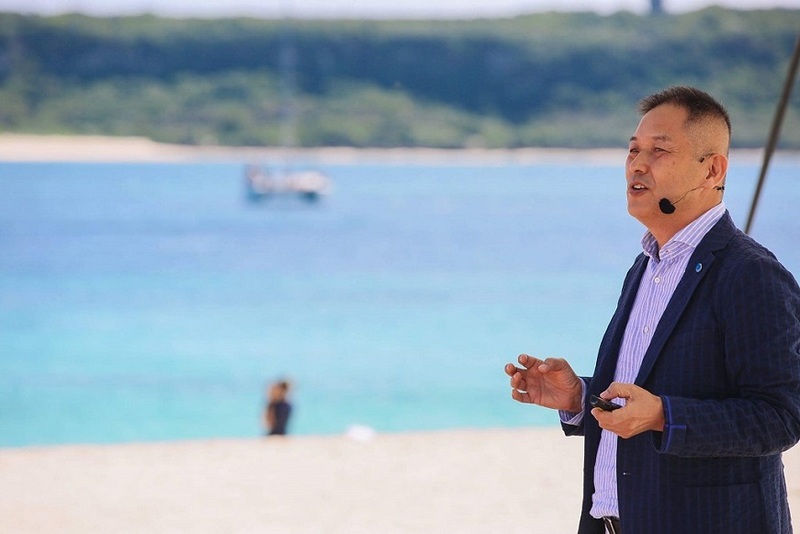 The theme of the event, held in the Tosho-gu World Heritage Site, was “coexistence with nature”. This resonated well with the underlying philosophy behind Ishigaki-yaki, namely to express in our pieces both human happiness and the eternal beauty of the Okinawan seas. This allowed the artist, Haruhiko Kaneko, to realise a world-first collaborative piece between pottery and bonsai. If our water, air, and food become polluted, we will wither and die. Kaneko placed a dish, representing the sea?water?as the ultimate source of all life, and a bonsai, representing the mountains which nurture the air, in a miniature garden, filled it with coral sand, to represent Earth seen from the universe and to communicate a message about how we should treasure our natural environment. The spatter-type pattern characteristic of yuteki tenmoku can be read as an expression of the multitude of stars in our university, and the sea, covering seven tenths of the surface, is representative of Earth. This piece is intended as an expression of the wish to see the beauty of Earth and her nature, as seen from beyond the stars, remains forever. 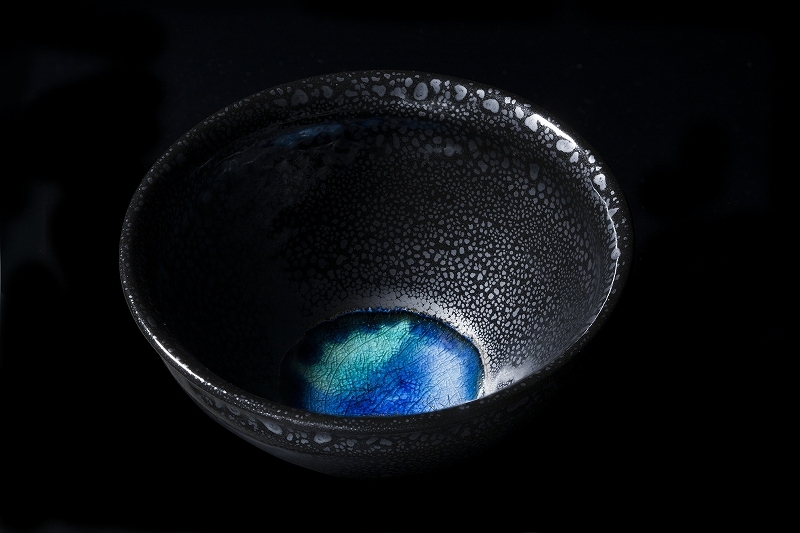 In the hekikai konoha tenmoku tea bowl, the leaf is intended to represent the mountains, thereby encapsulating both the mountains and the oceans, as seen from space, within the confines of a delicate tea matcha tea bowl.